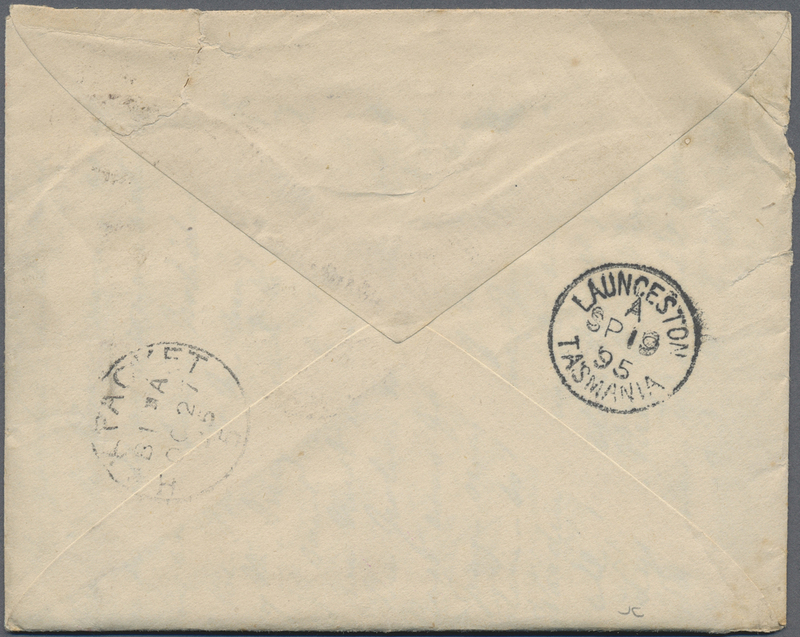 11351 Ganzsache (Complete) Tinsley 3j 1892. 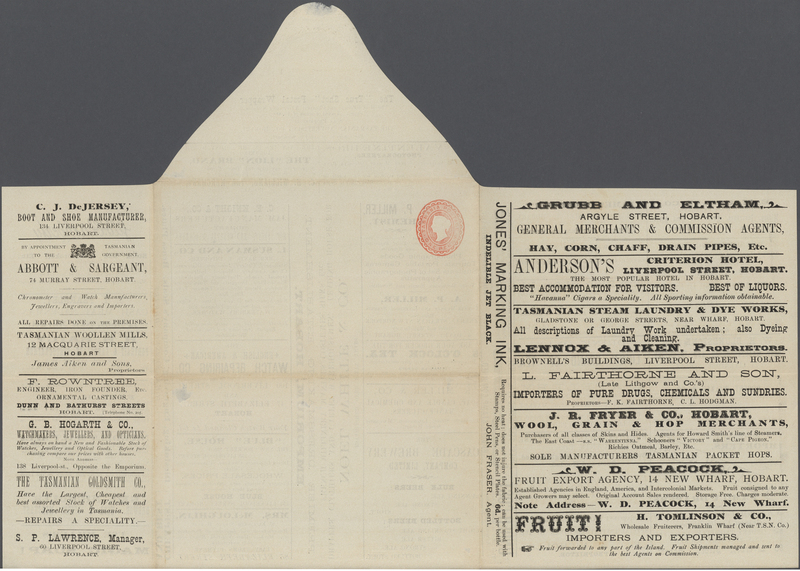 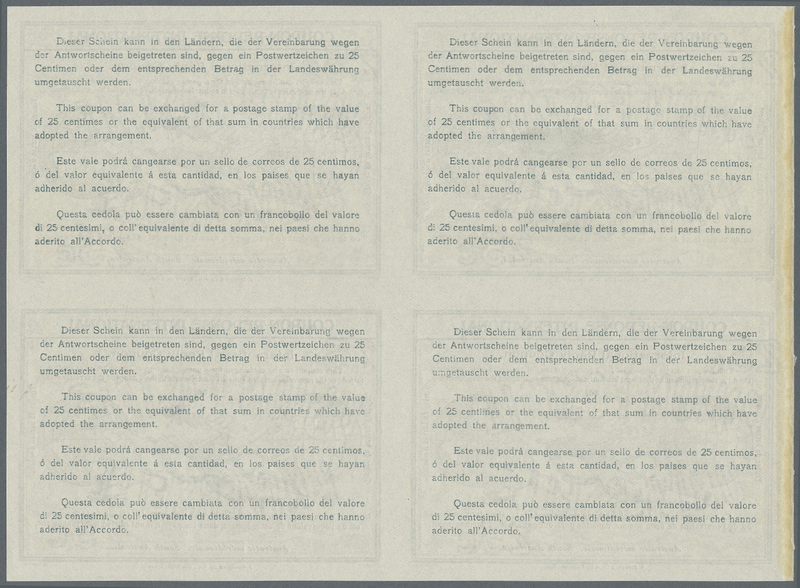 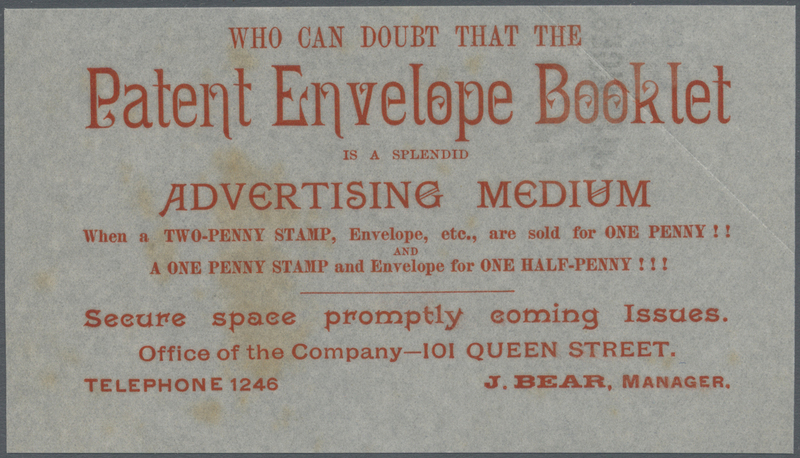 RARE Printed to Private Order Advertising Lettersheet (1 Indicium) "The True Shot Postal Wrapper" black print on white paper with 5 advertising panels as well a 6th under the sealing flap. 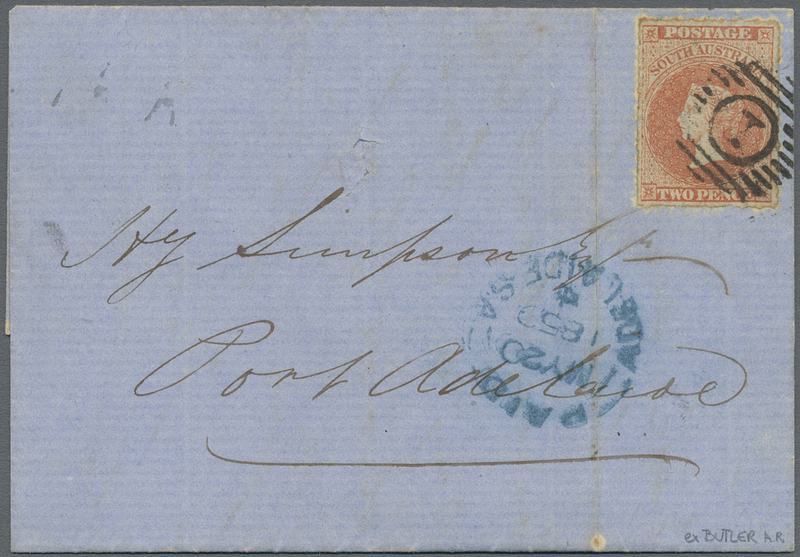 1892 one penny red. 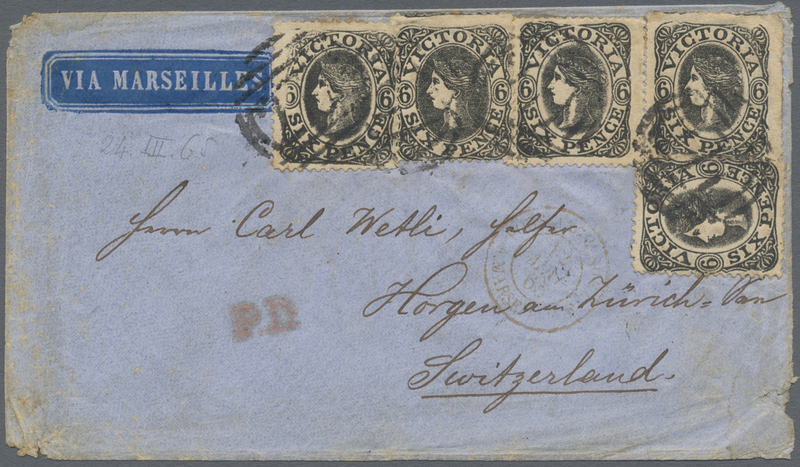 11352 Ganzsache (Complete) 1894. 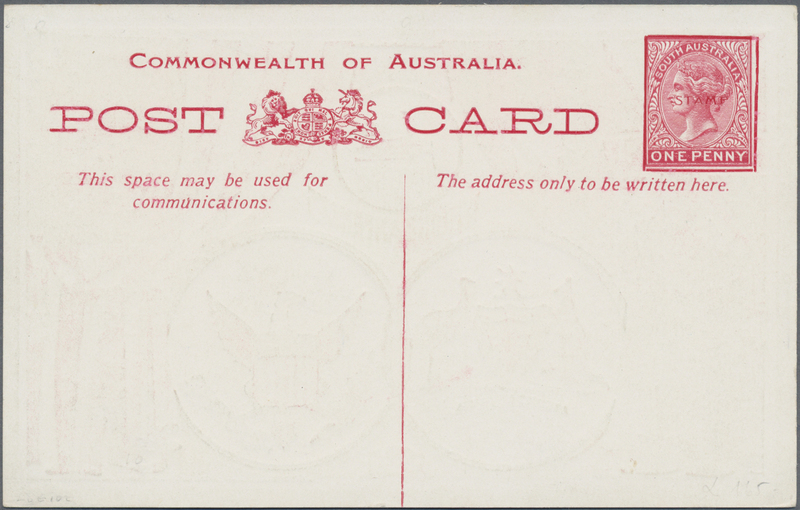 Printed To Private Order Platypus Stamp Duty Wrapper 6d Red. 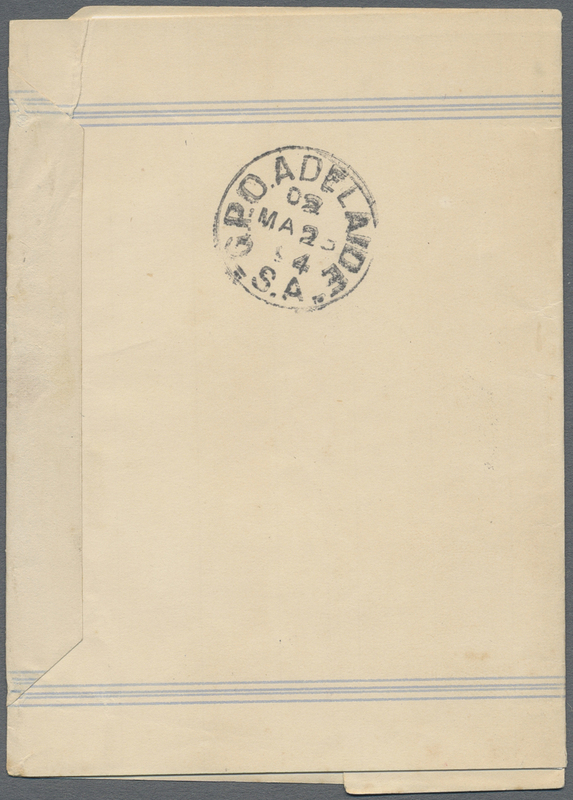 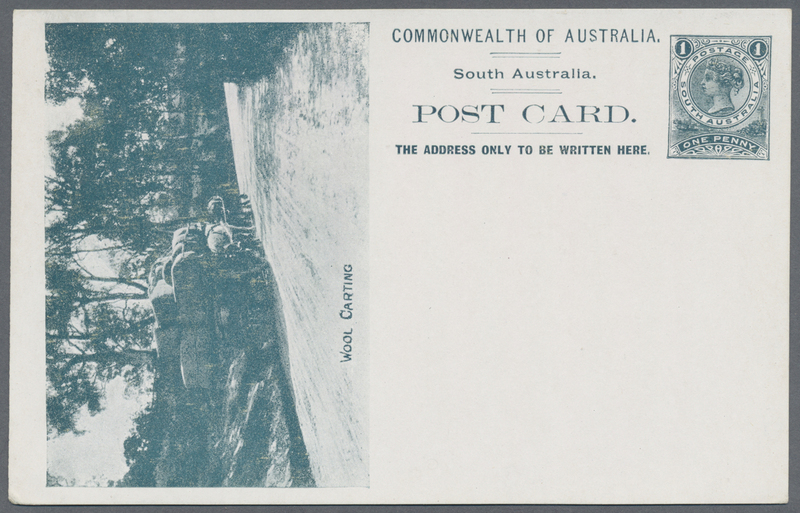 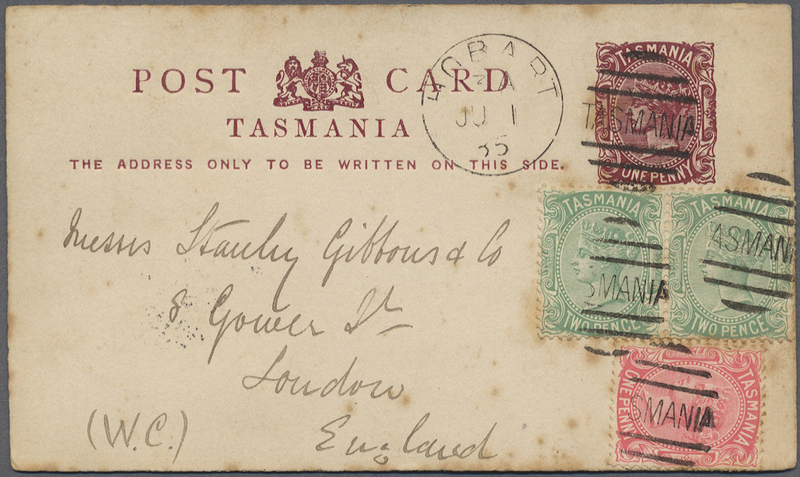 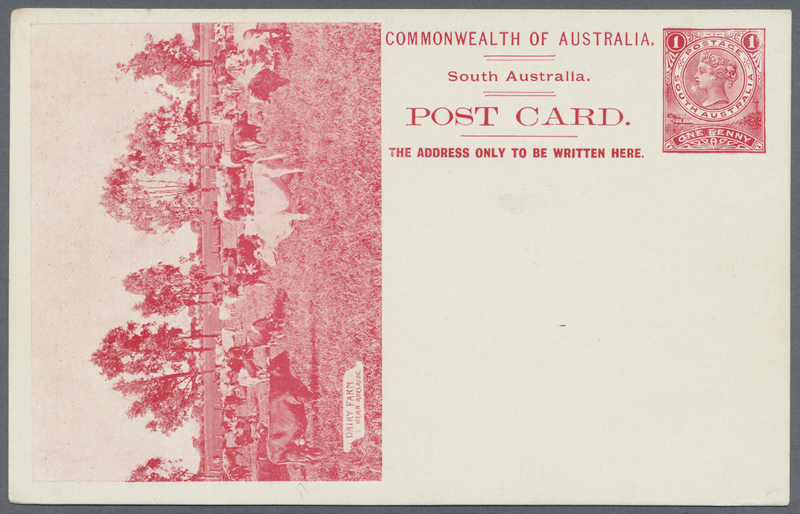 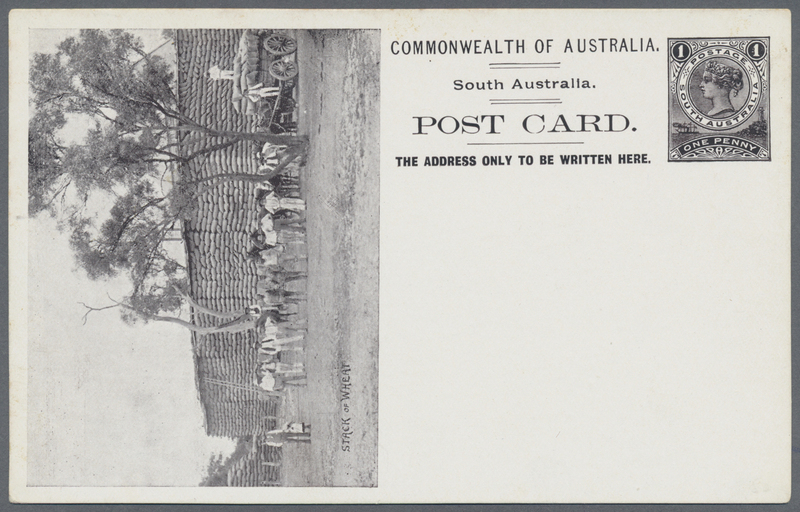 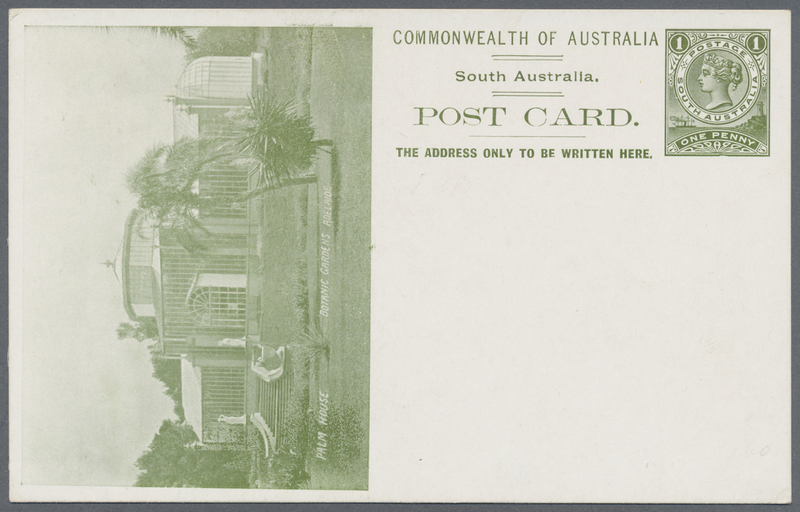 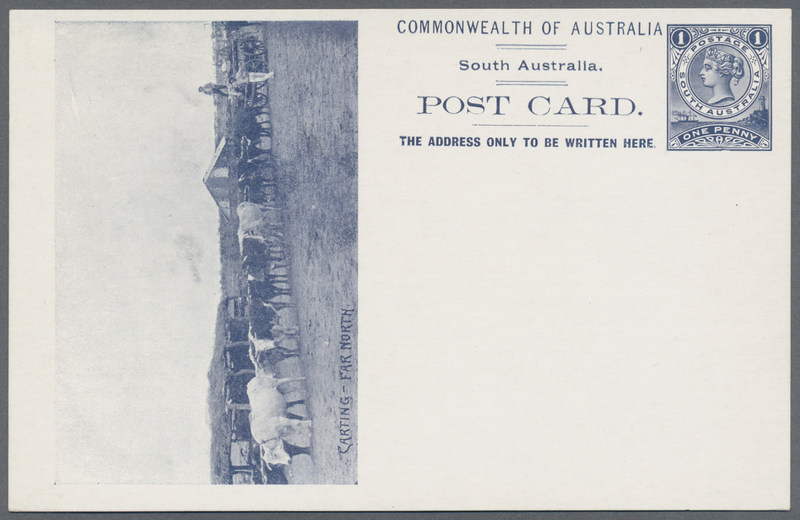 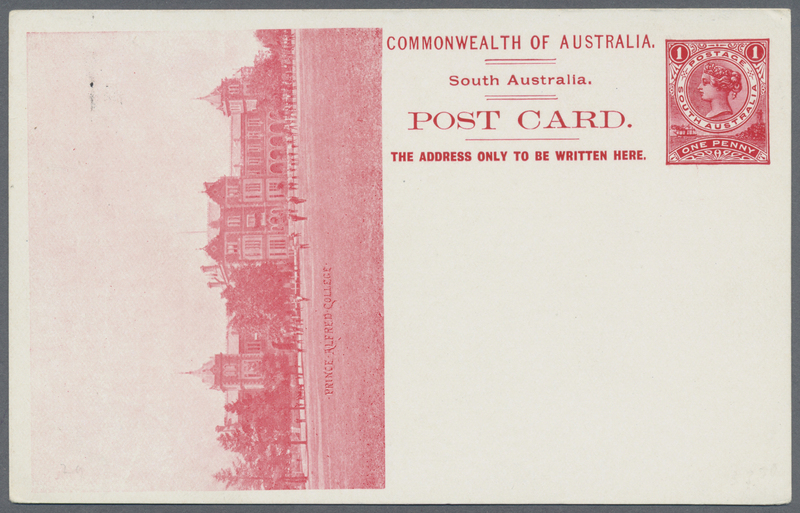 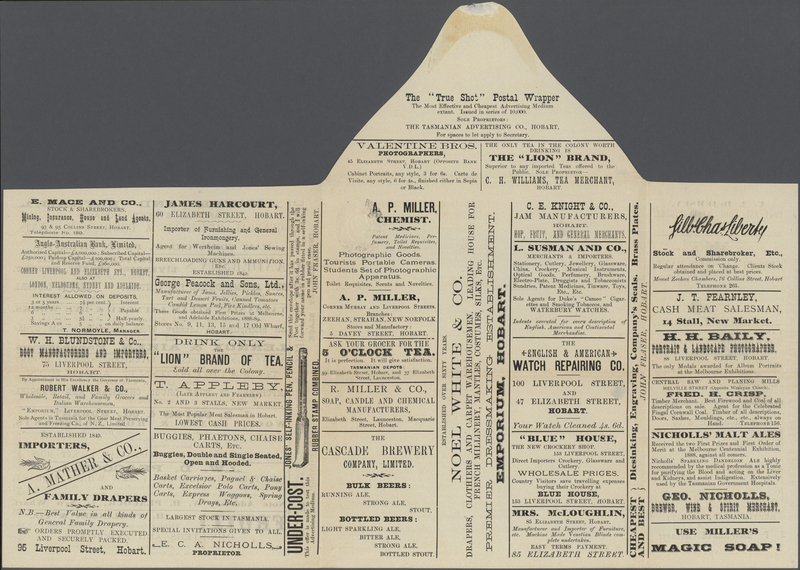 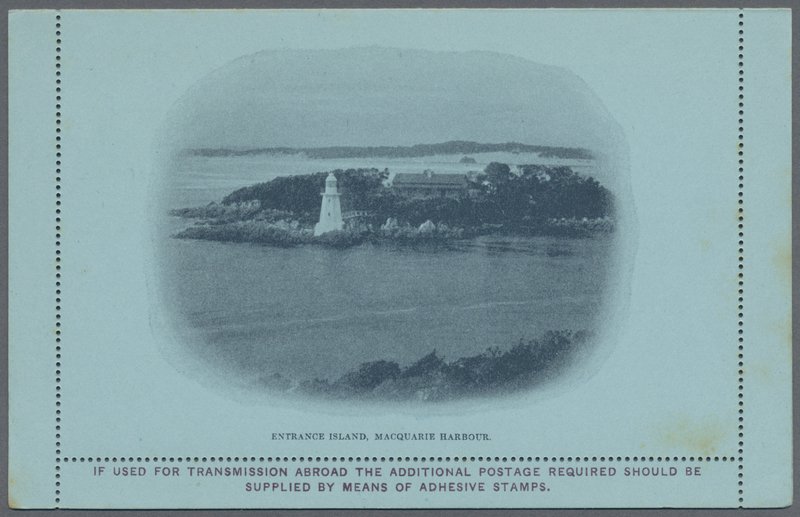 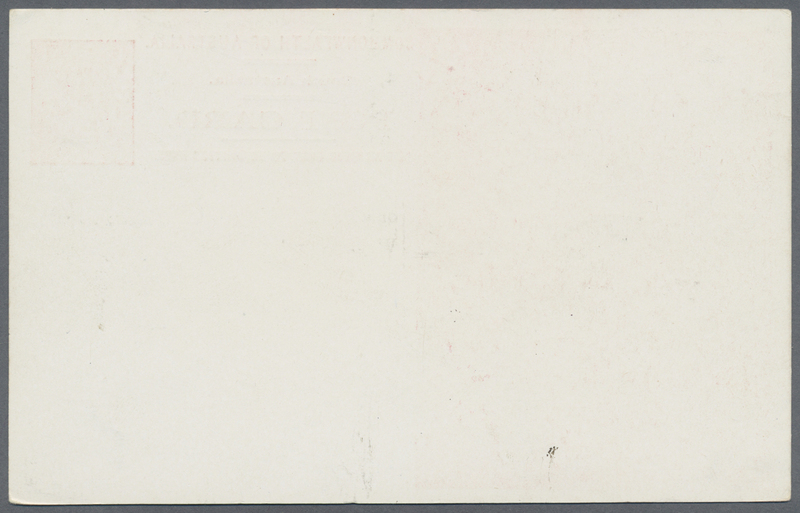 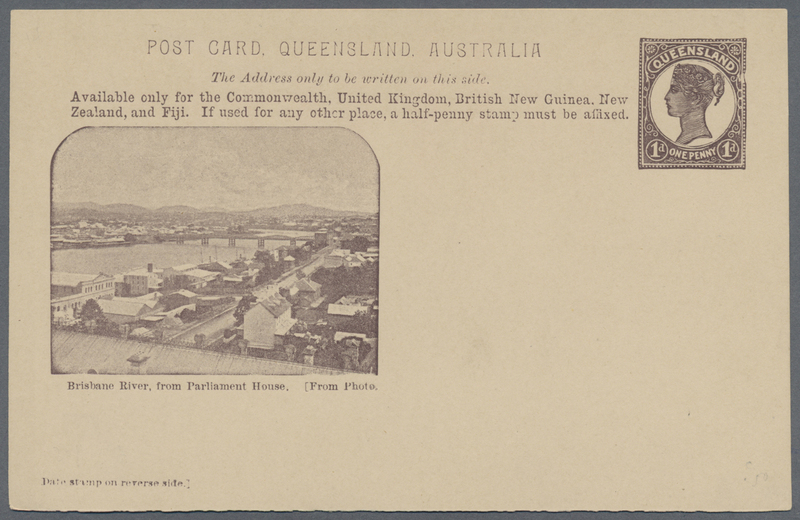 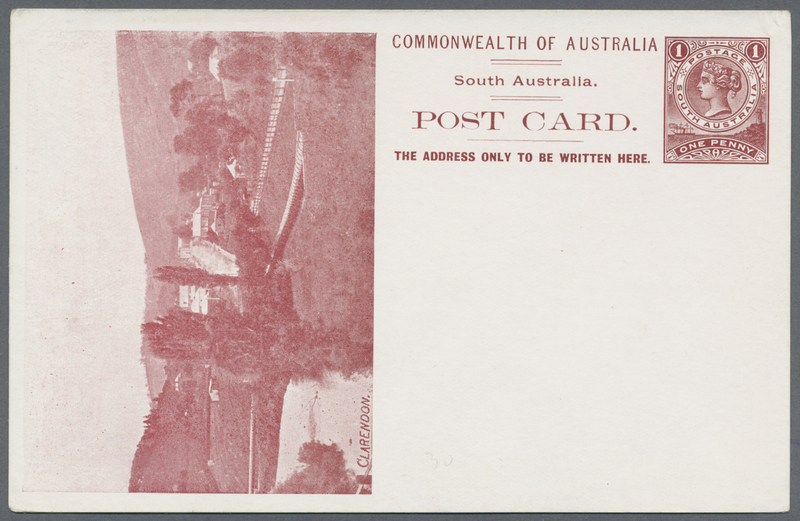 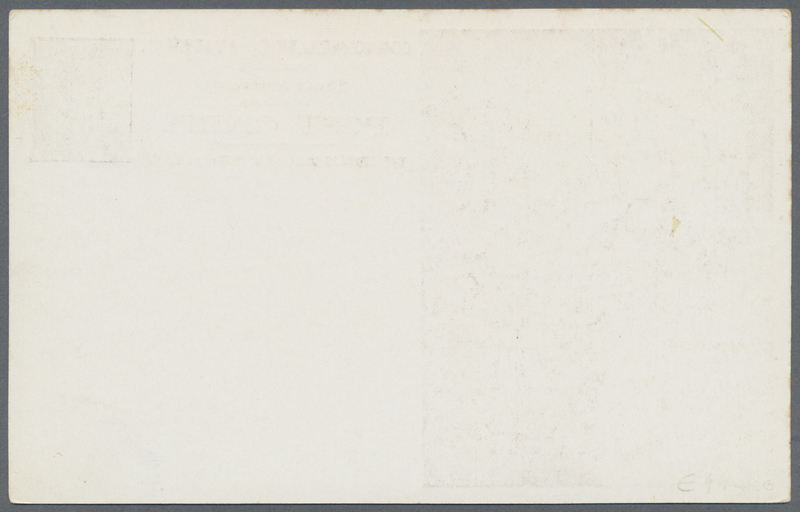 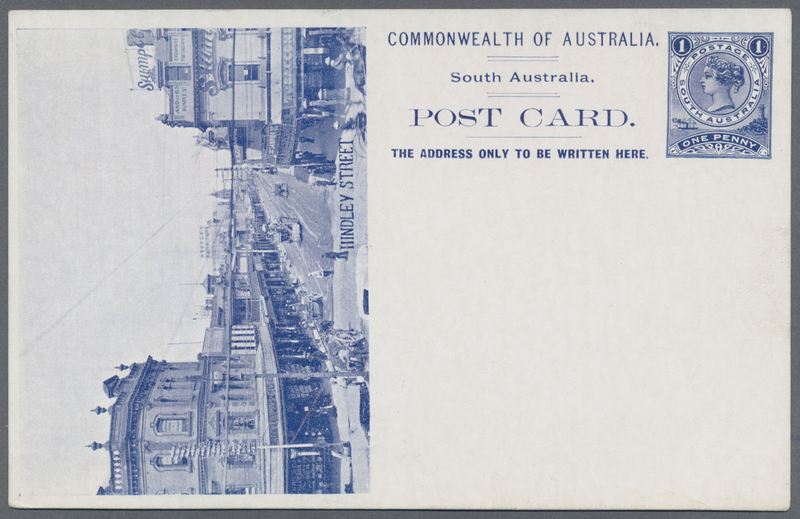 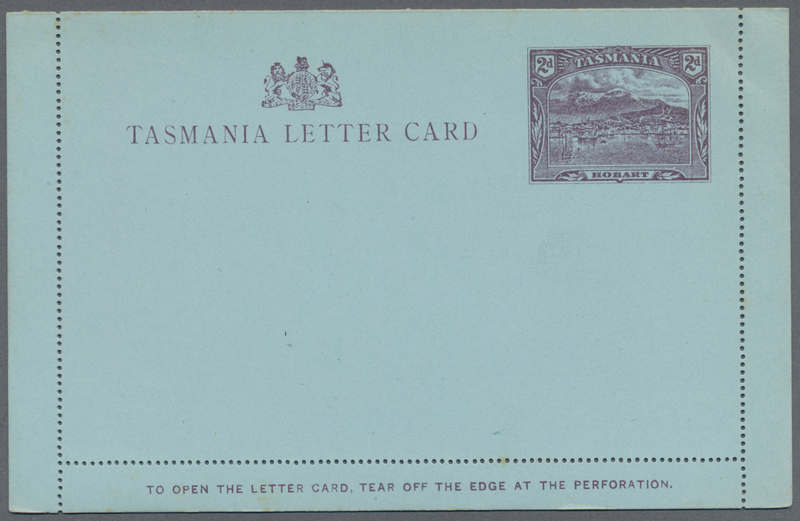 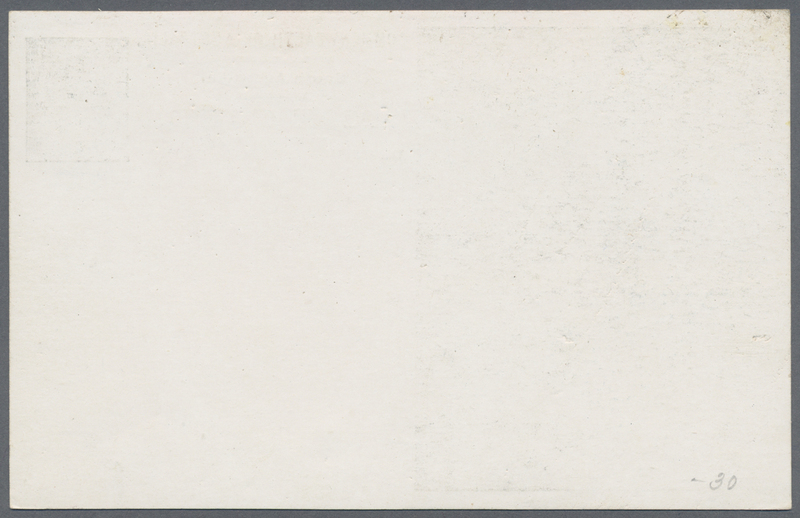 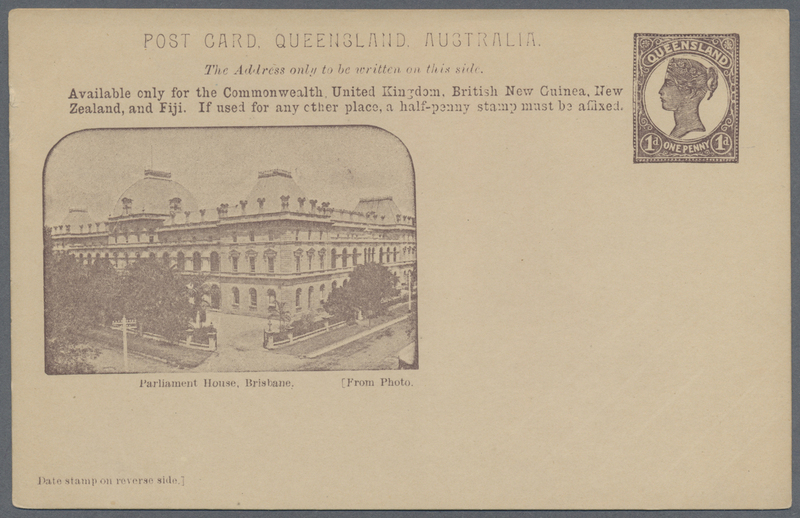 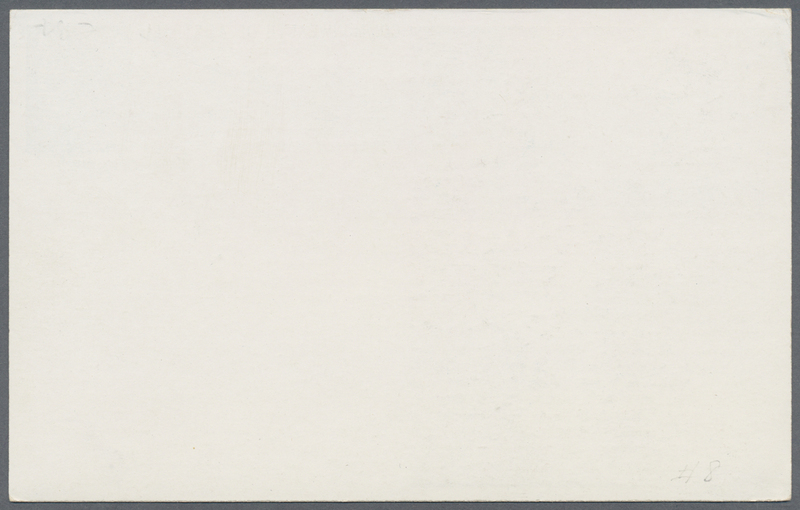 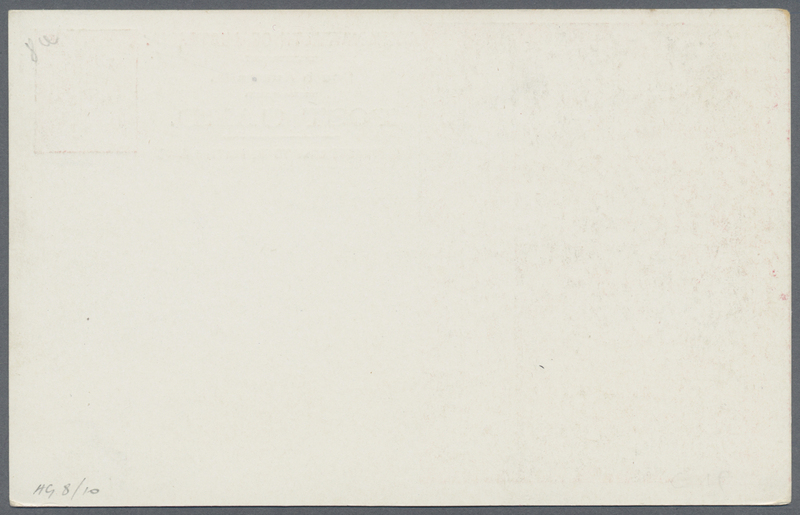 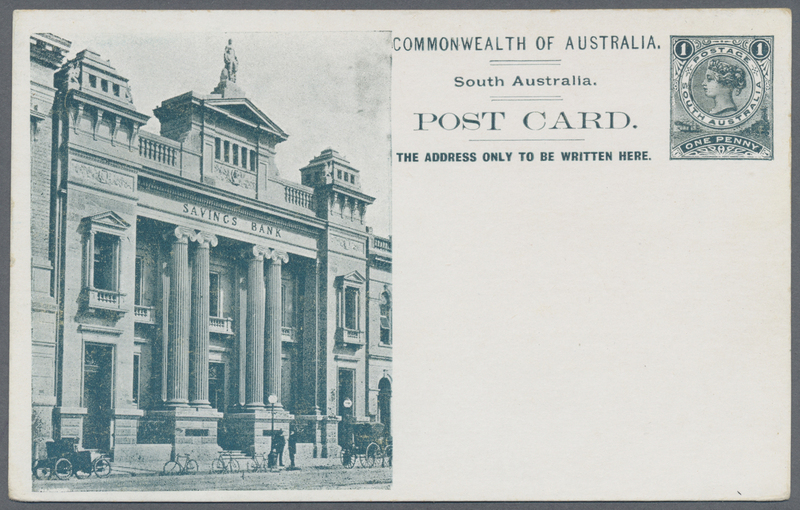 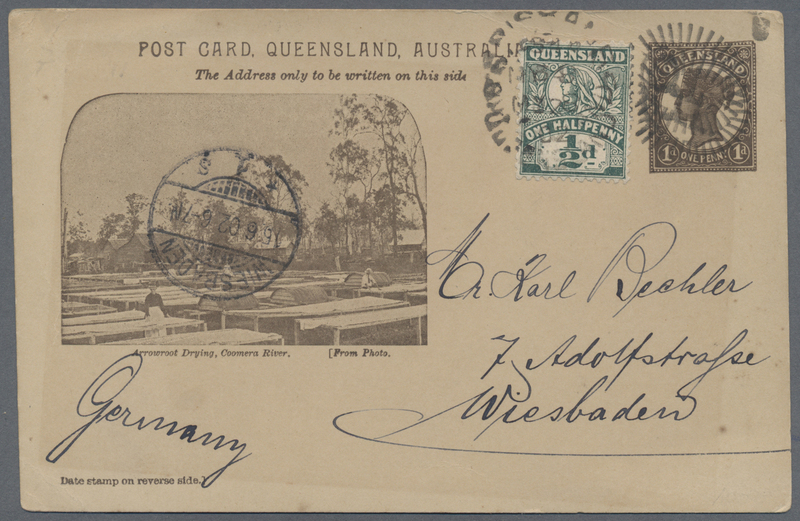 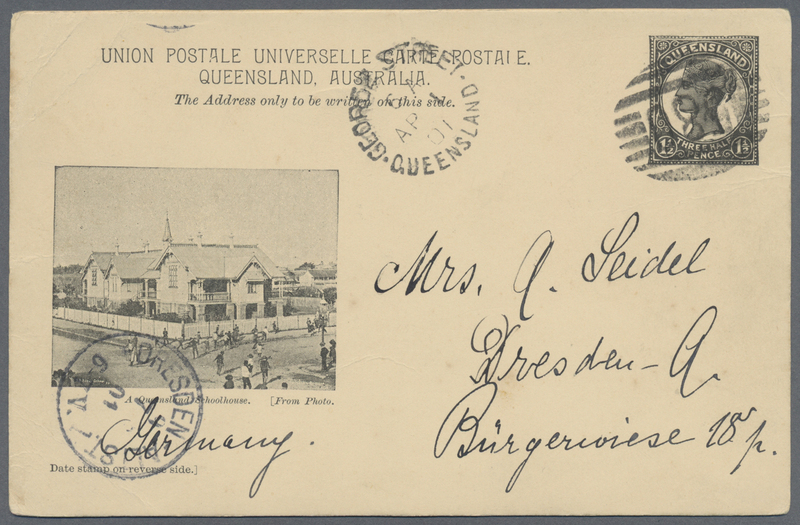 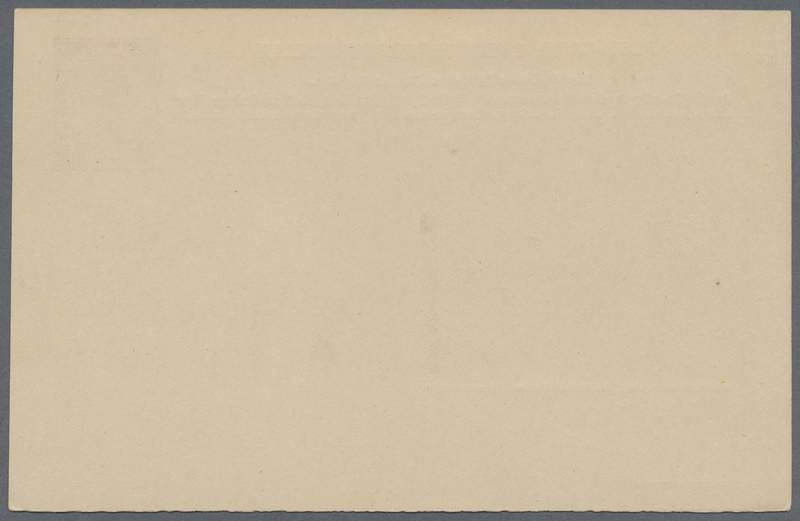 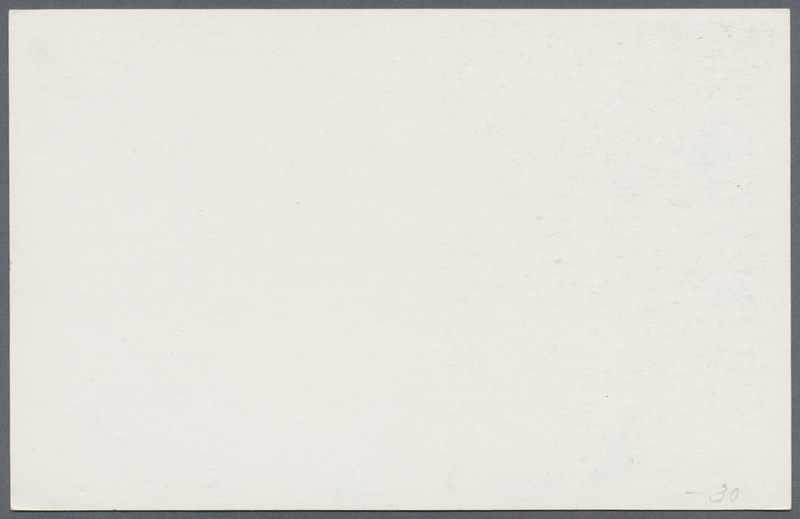 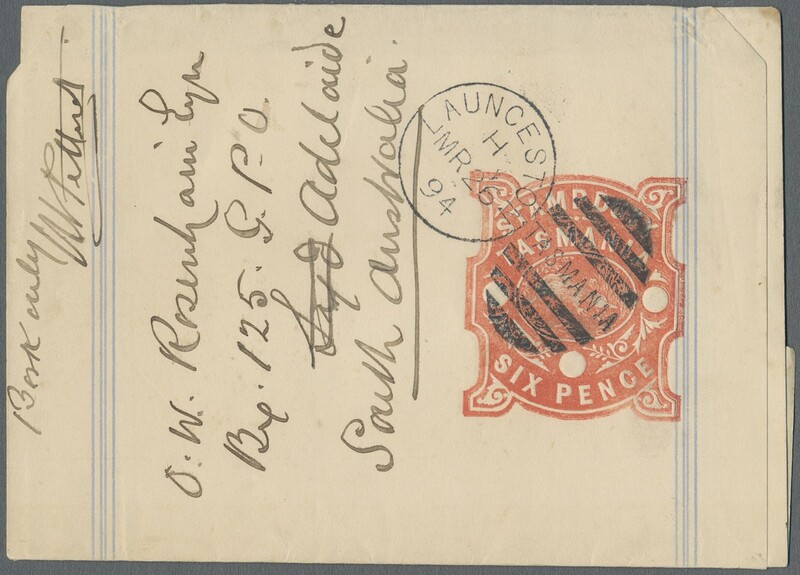 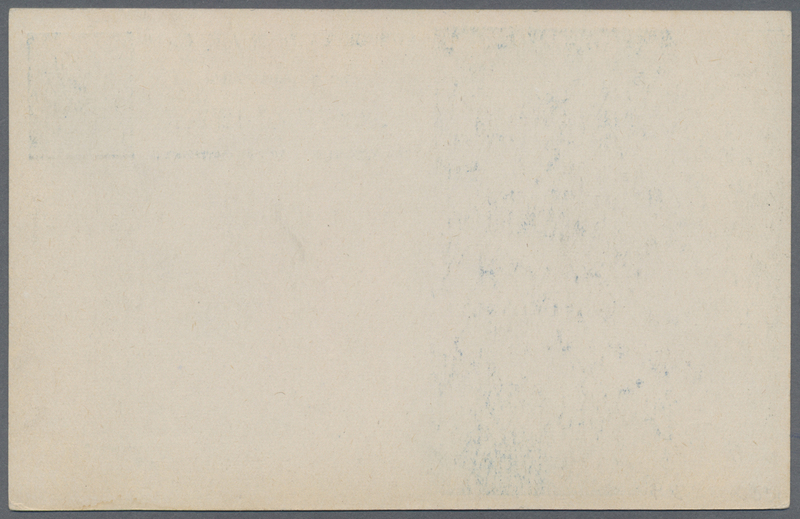 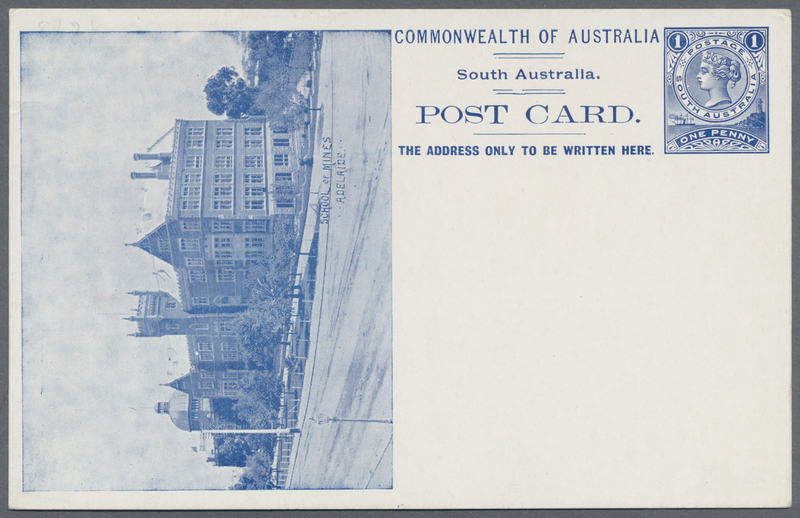 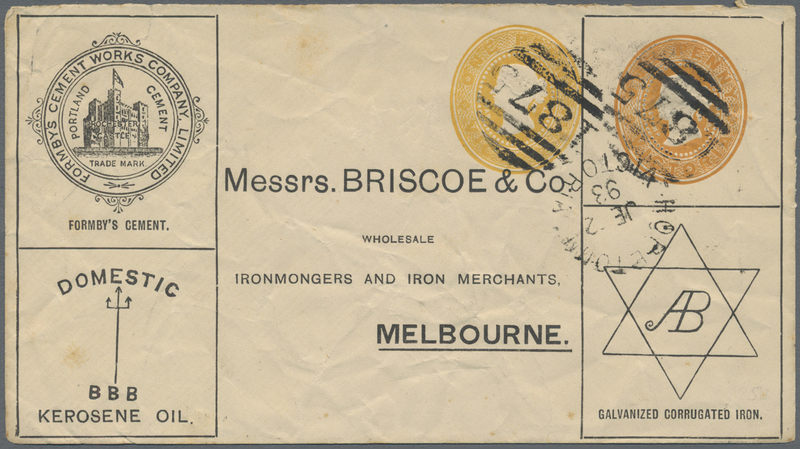 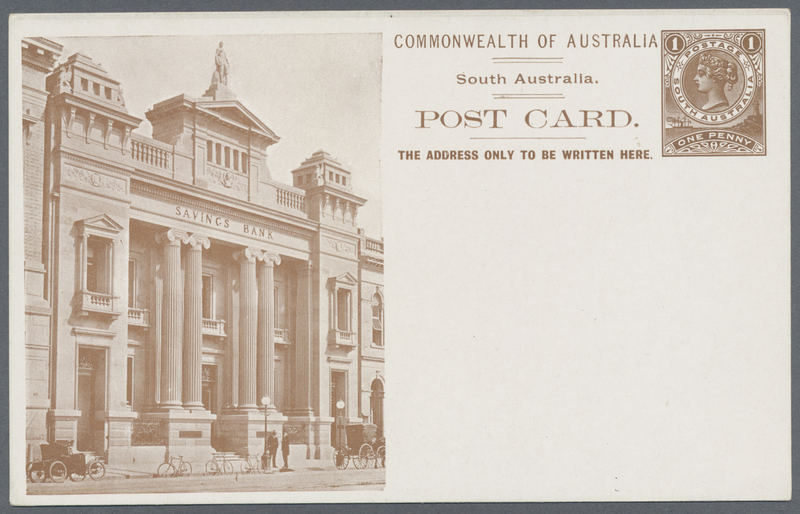 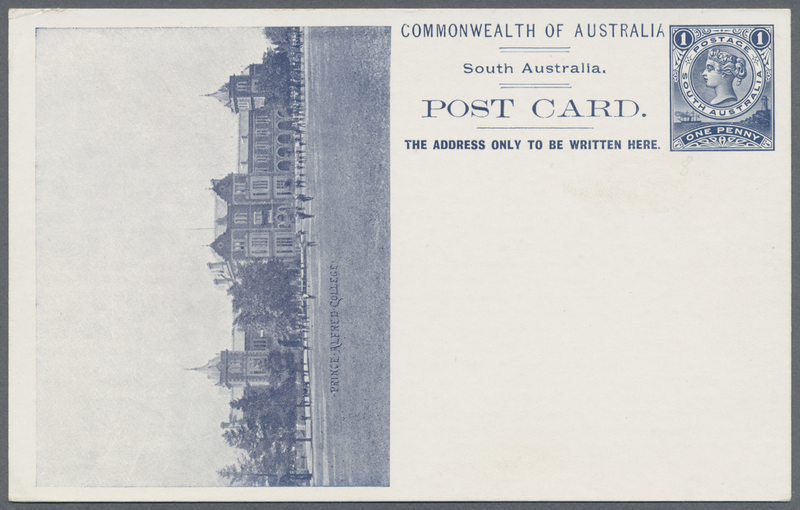 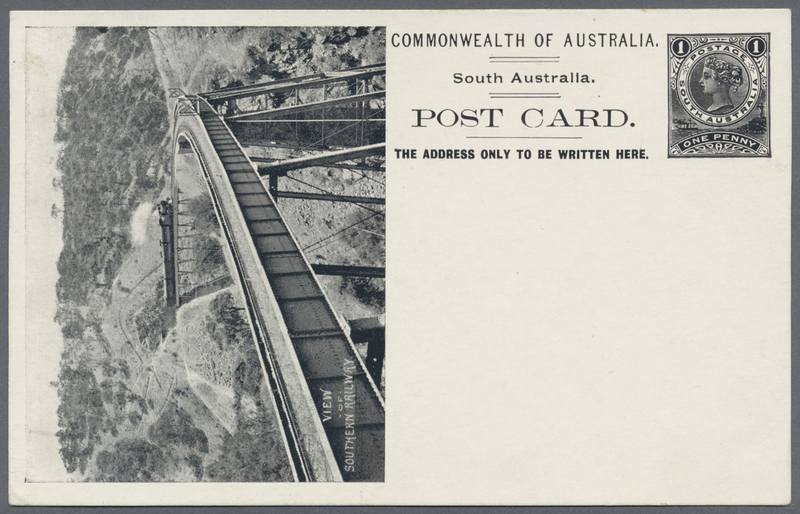 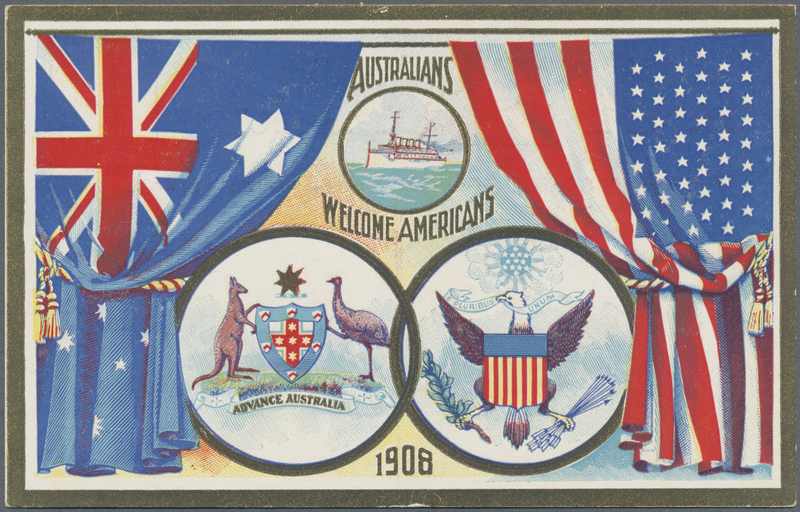 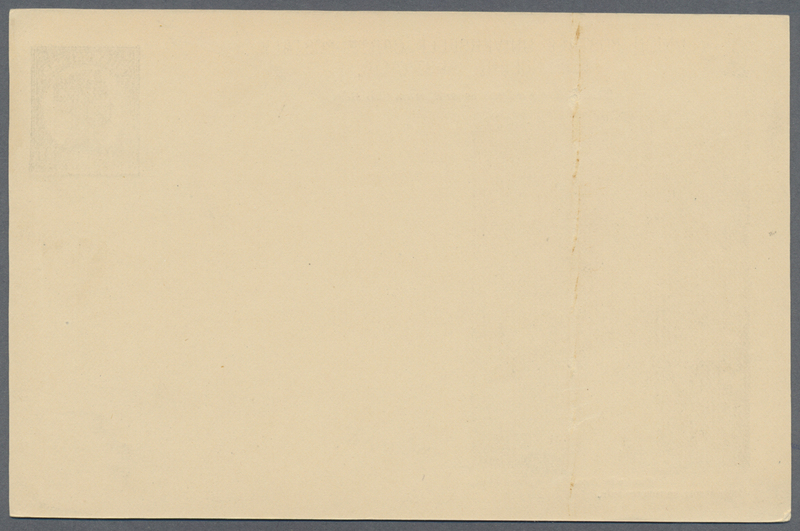 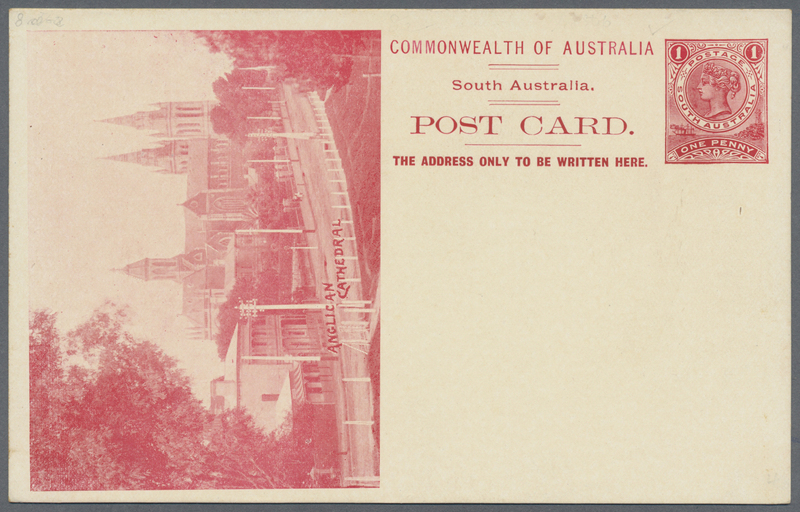 Used from Launceston on March 26, 1894 to Adalaide, South Australia, arriving March 28, 1894. 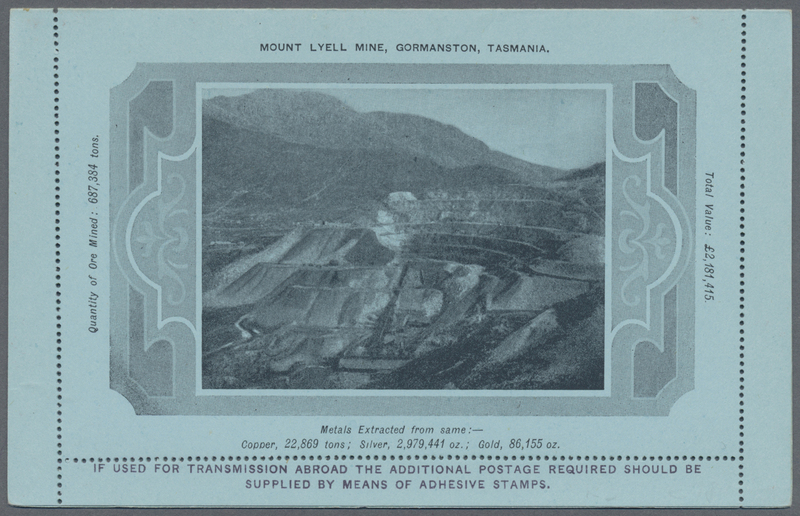 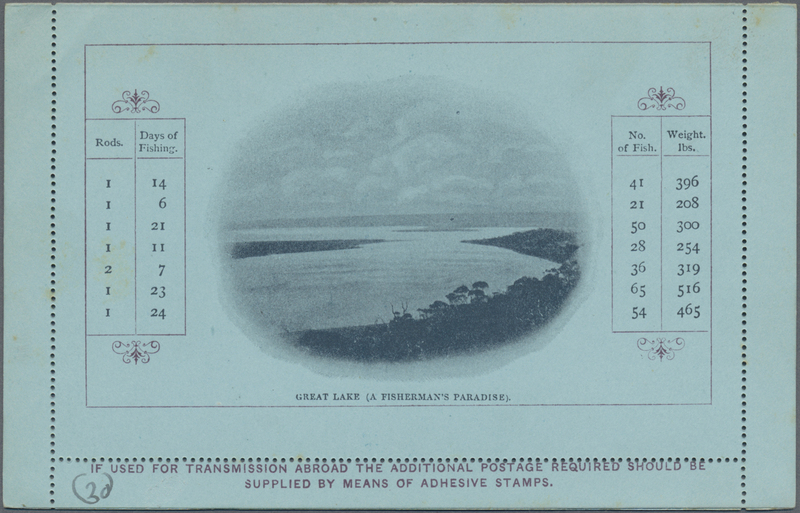 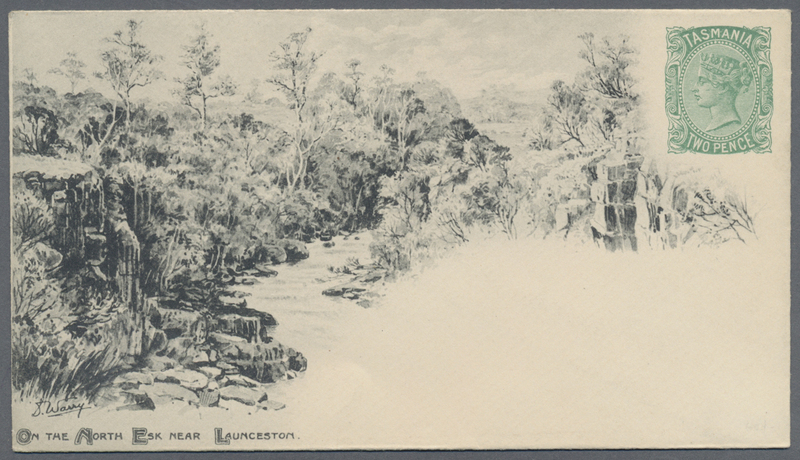 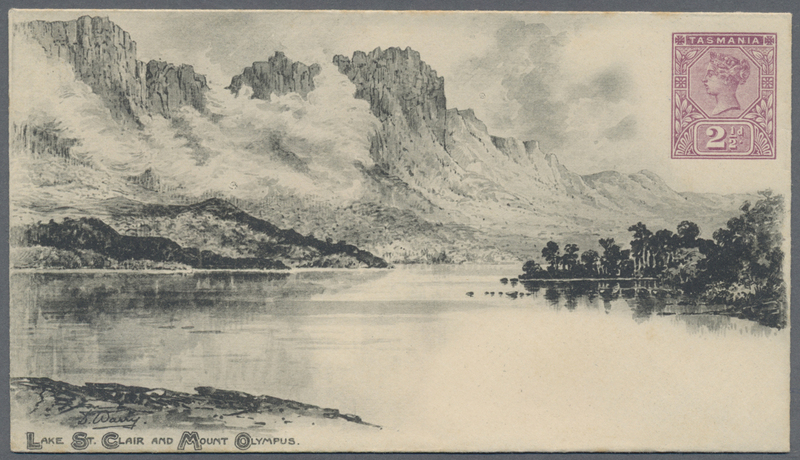 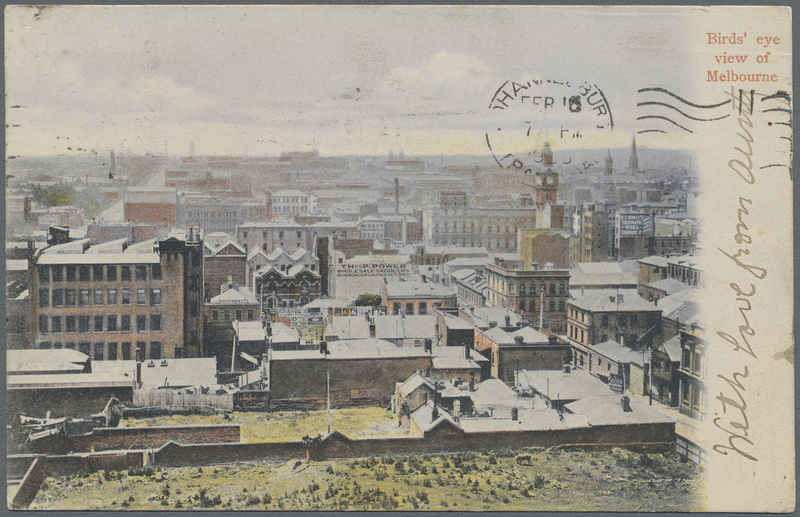 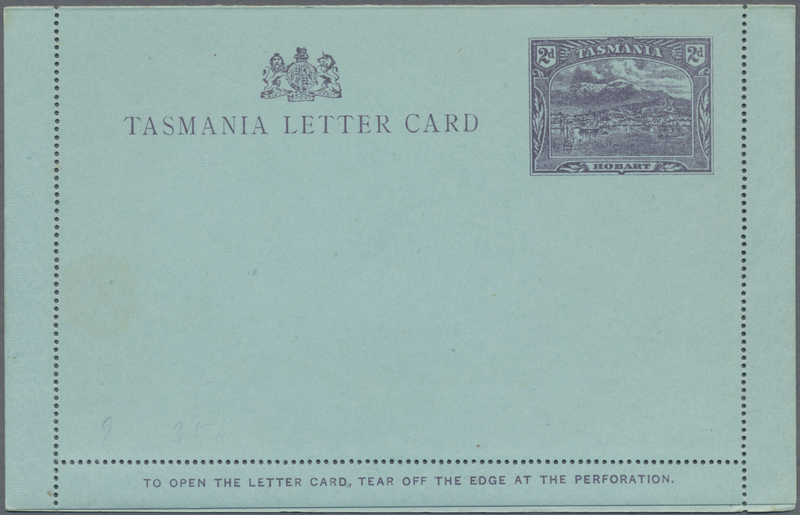 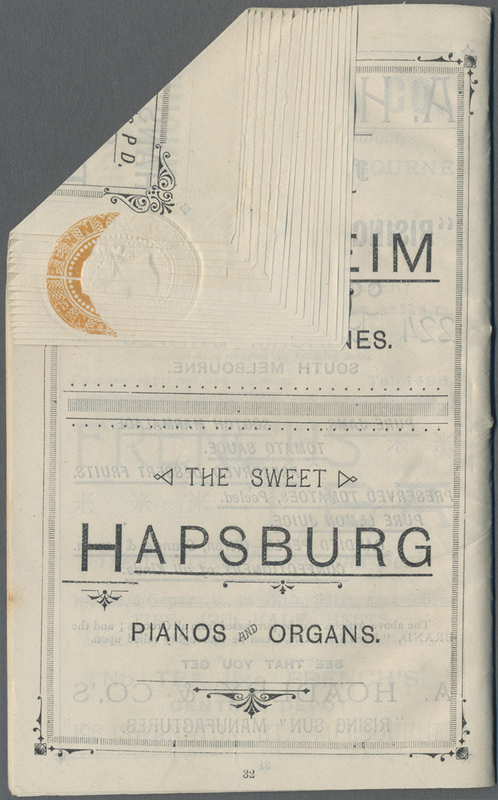 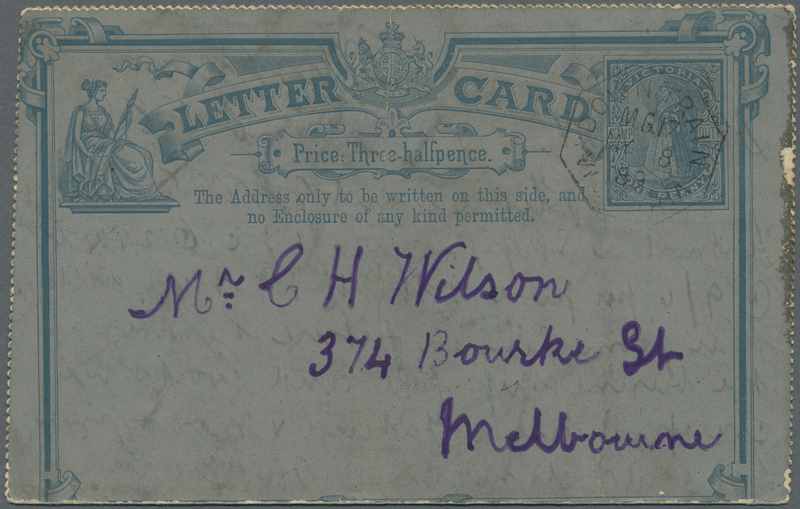 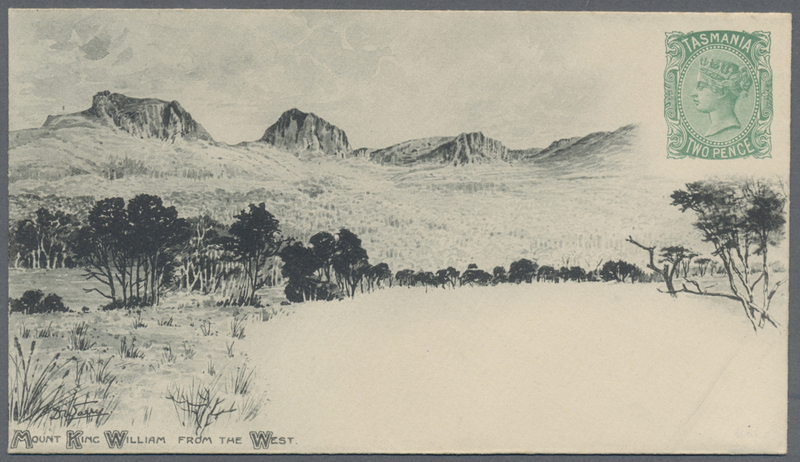 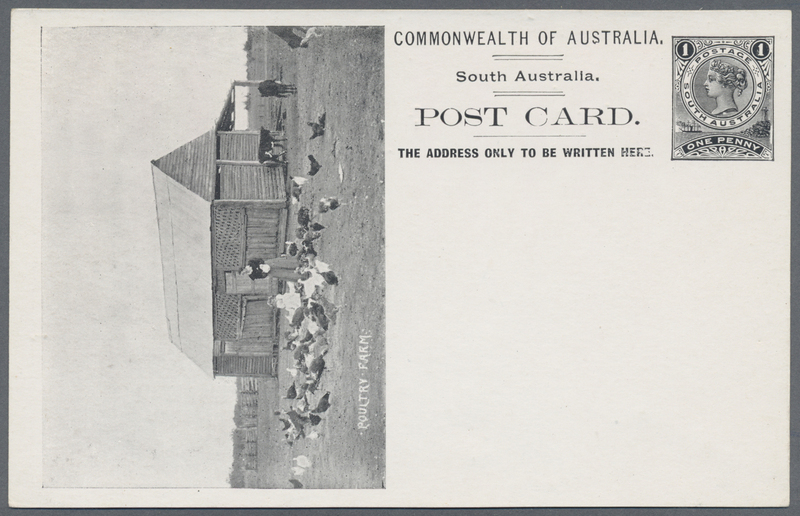 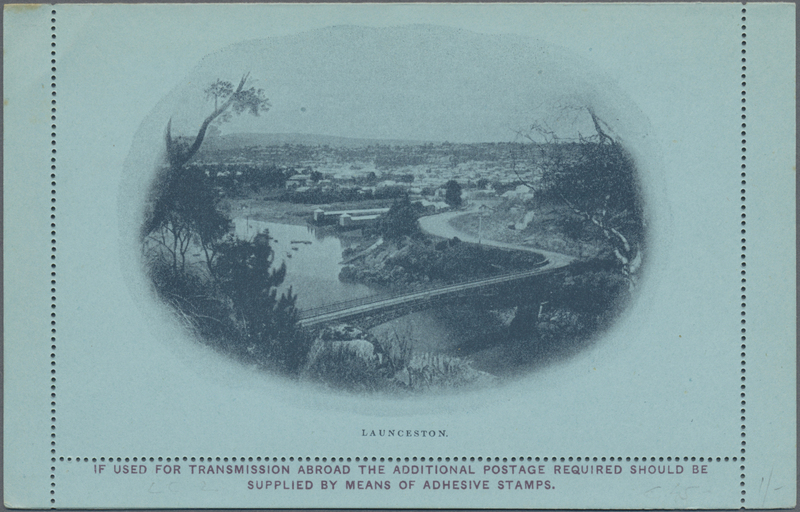 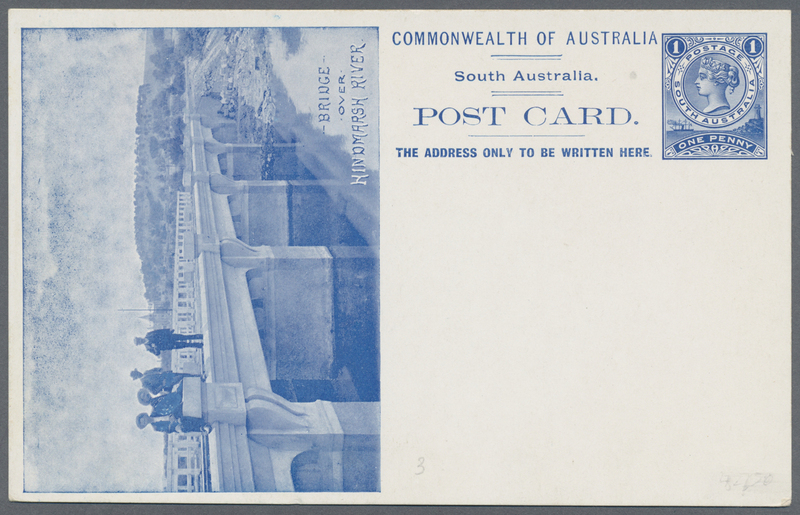 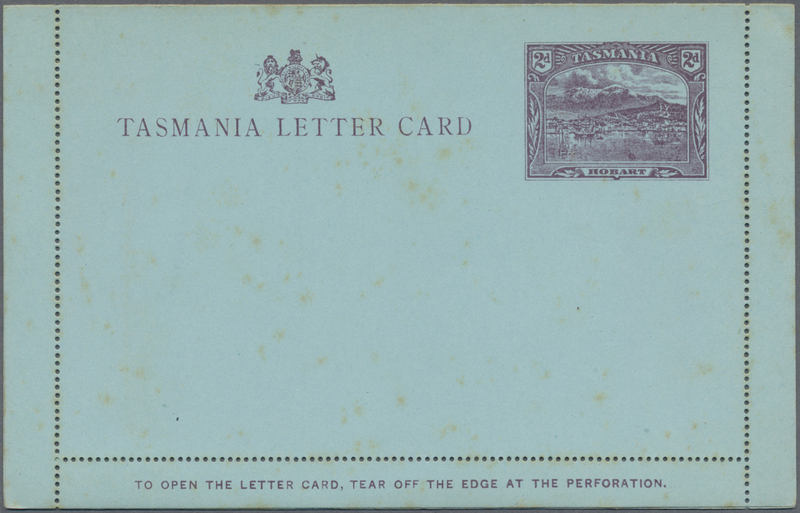 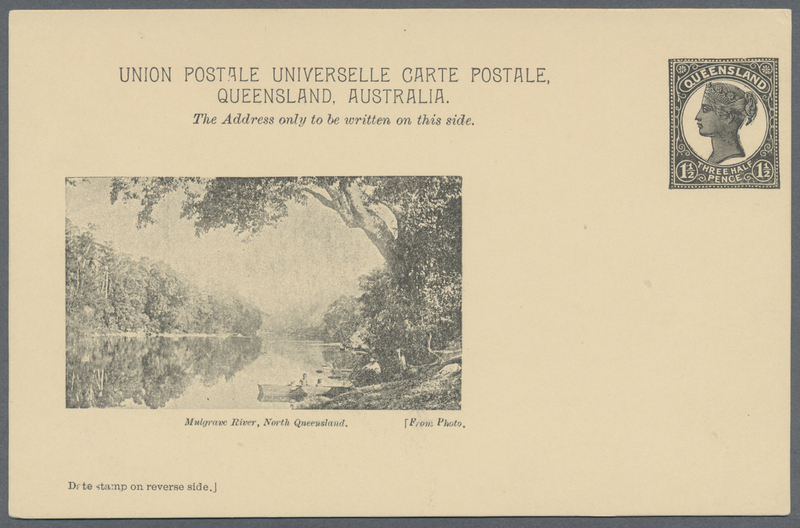 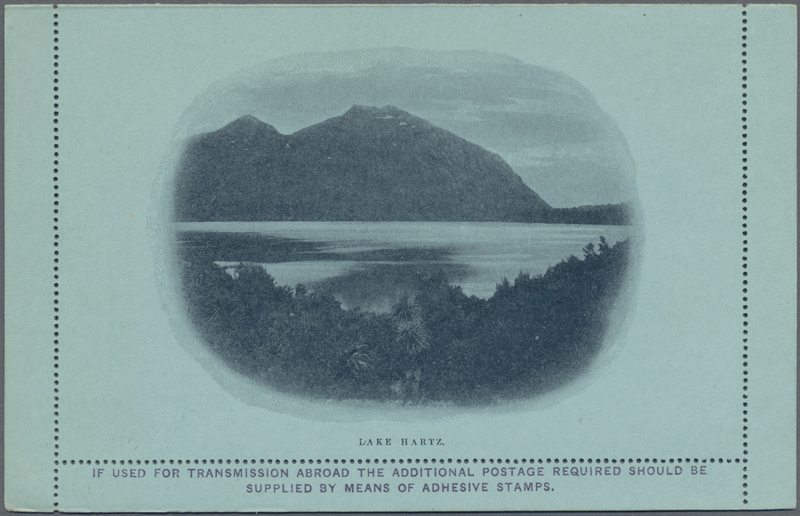 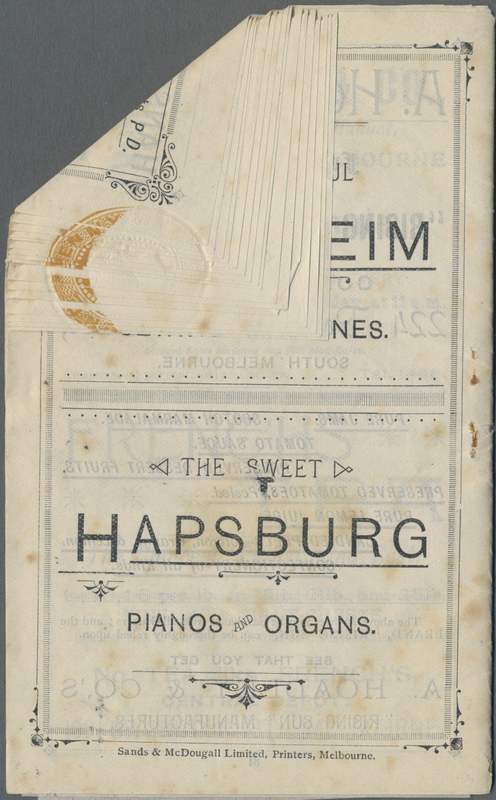 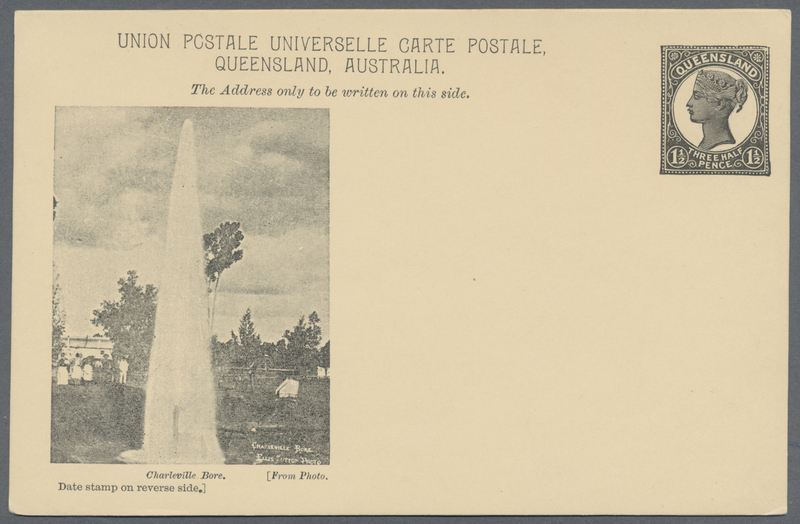 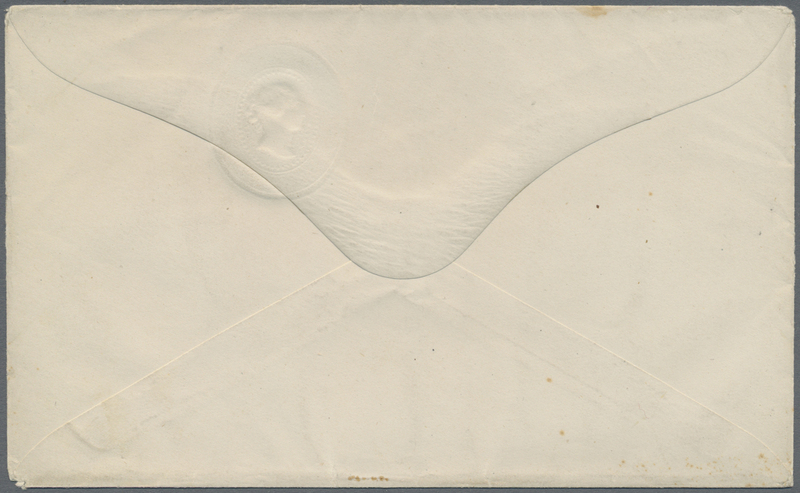 From the same documented correspondence as the 3d Wrapper pictured on page 97 of Tasmania by W.E. 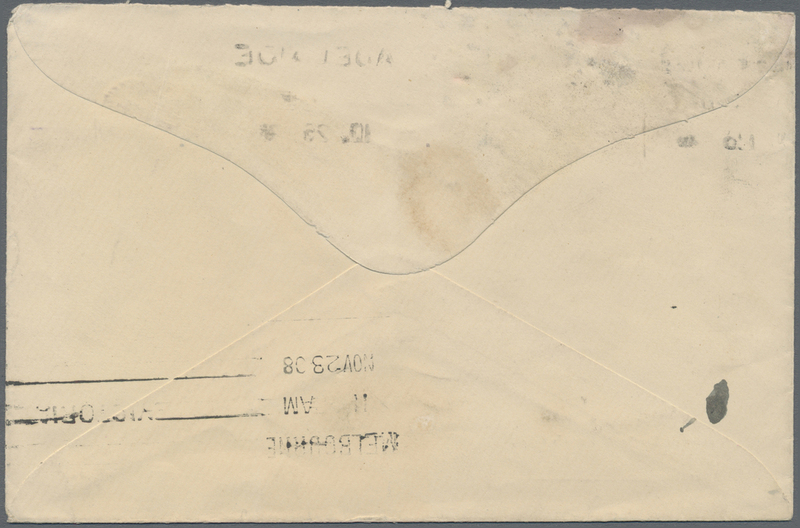 Tinsley. 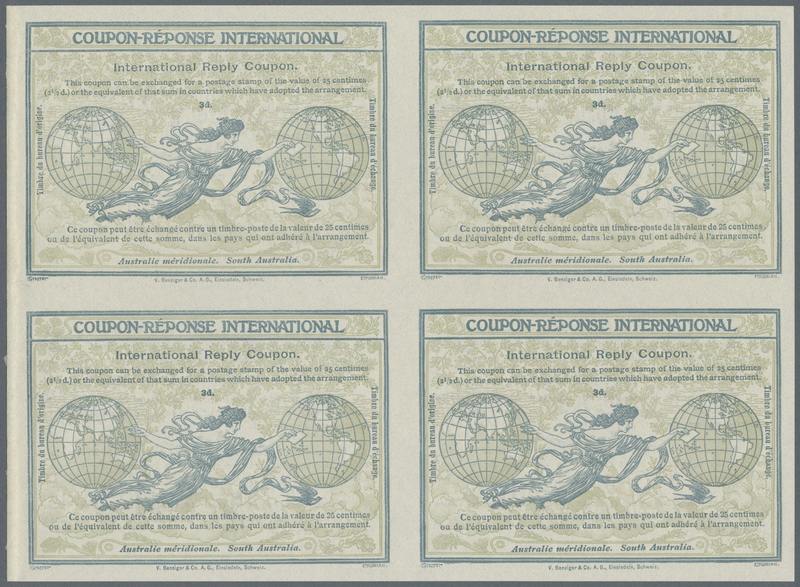 This is an extremely rare high-denomination wrapper USED, the cost of which is justified by the manuscript notation "Book only", indicating heavy printed matter. 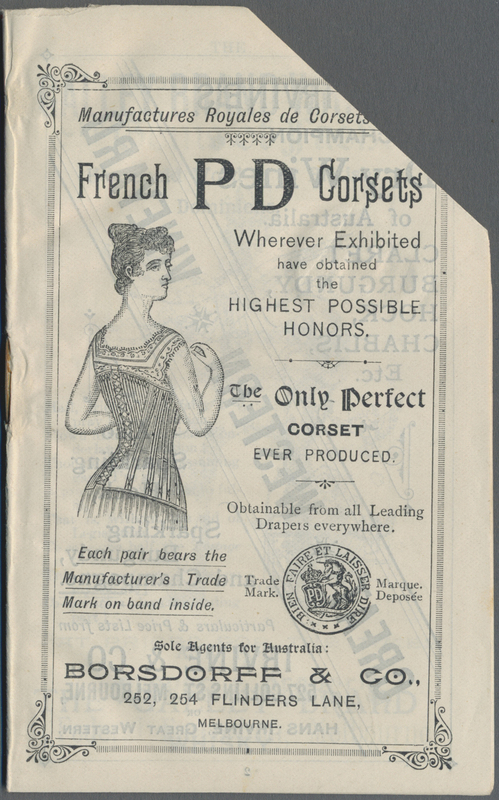 There are only 3 recorded used, plus 1 partial front. 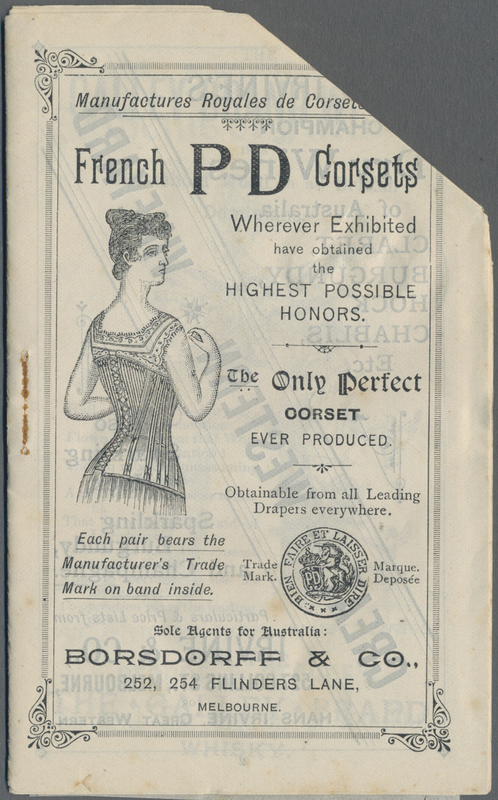 THIS IS THE FINEST. 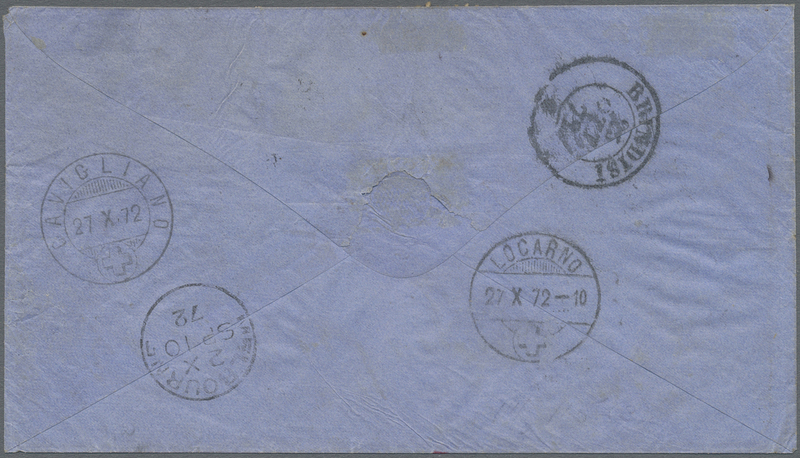 11353 Ganzsache (Complete) 1896. 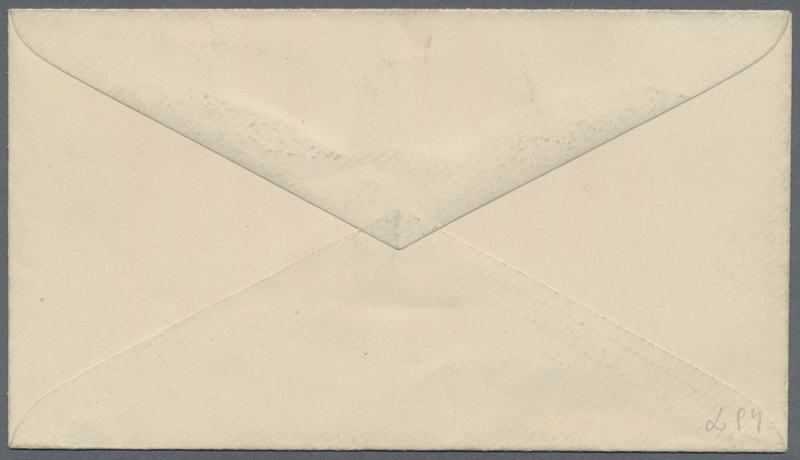 Printed To Private Order Envelope with 3 embossed Indicia 2d + 2 d red + 1 d green. 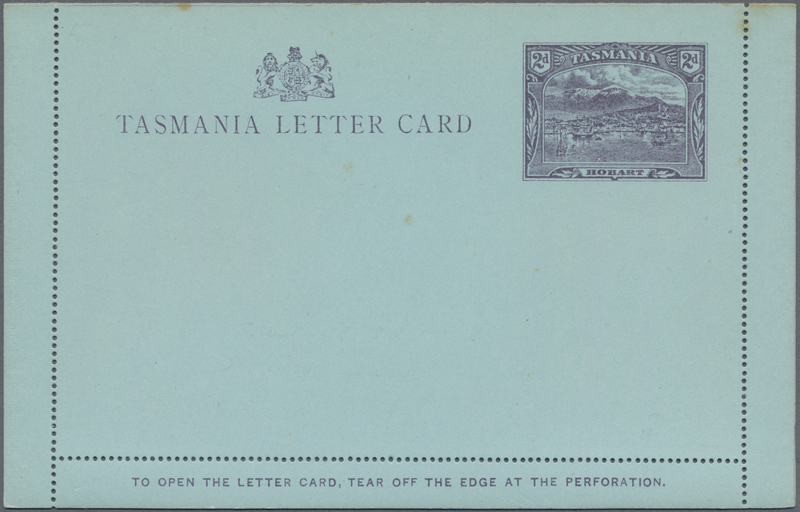 Not listed in Higgins & Gage, but noted in Tasmania by Tinsley on page 174. 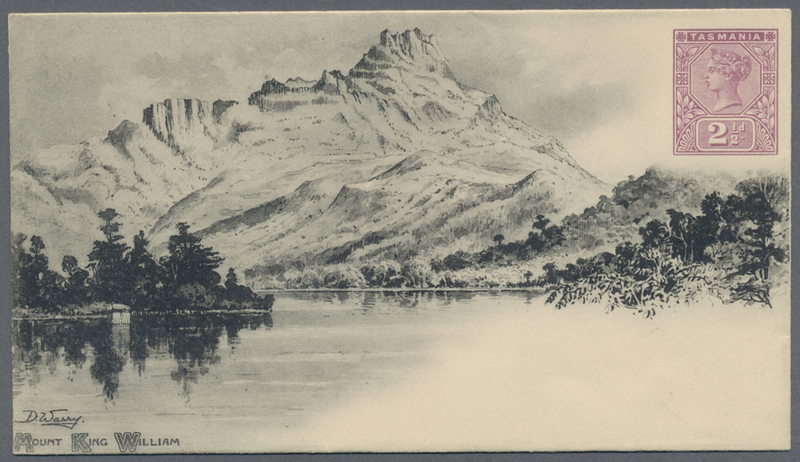 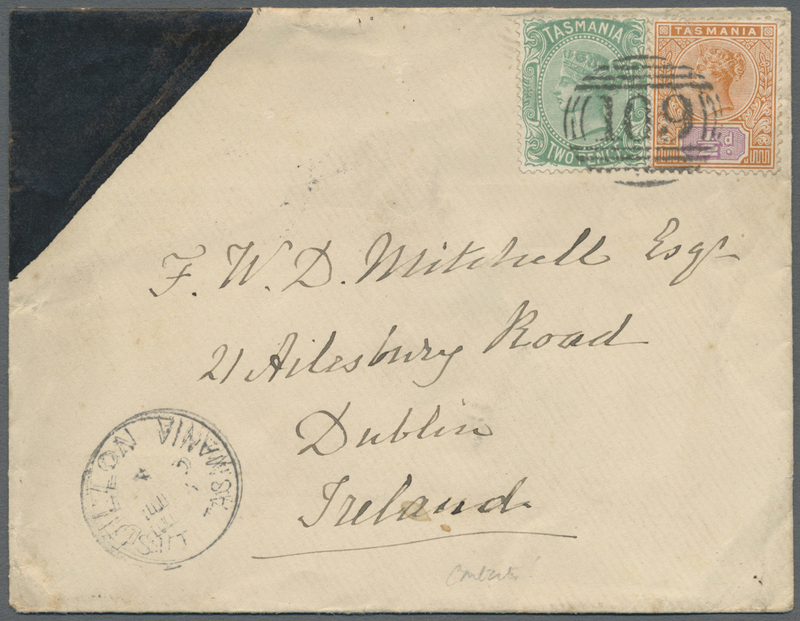 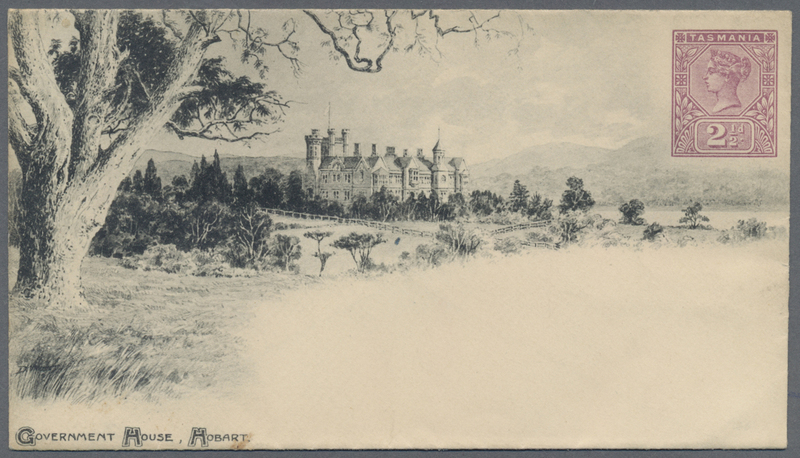 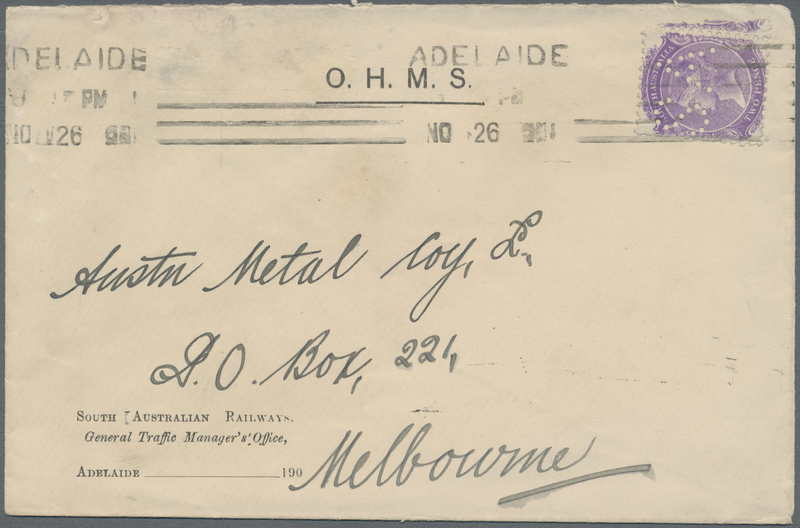 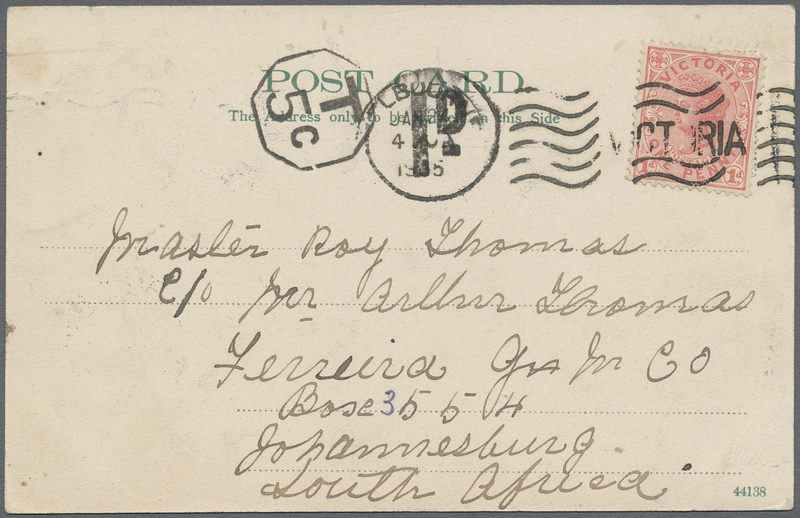 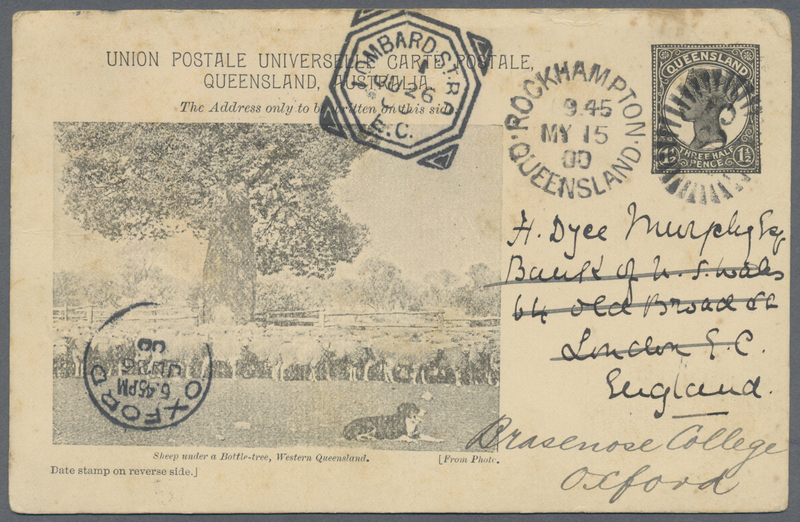 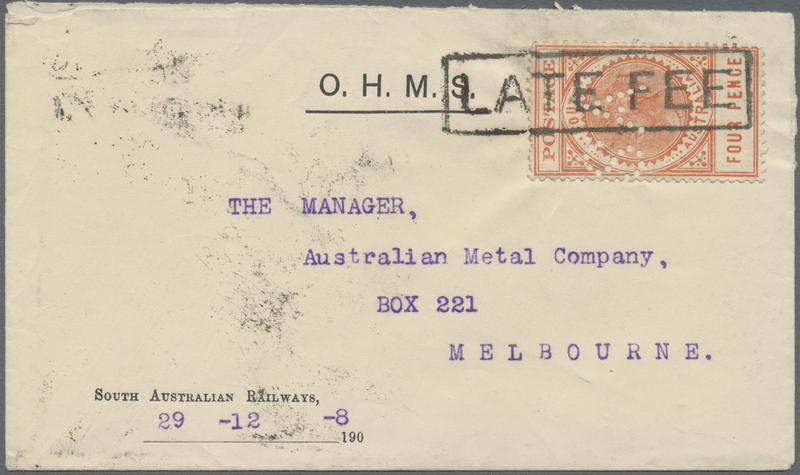 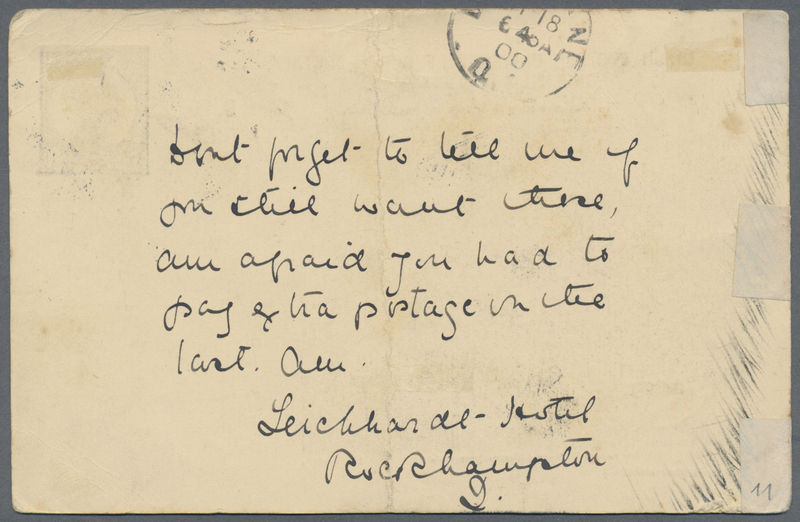 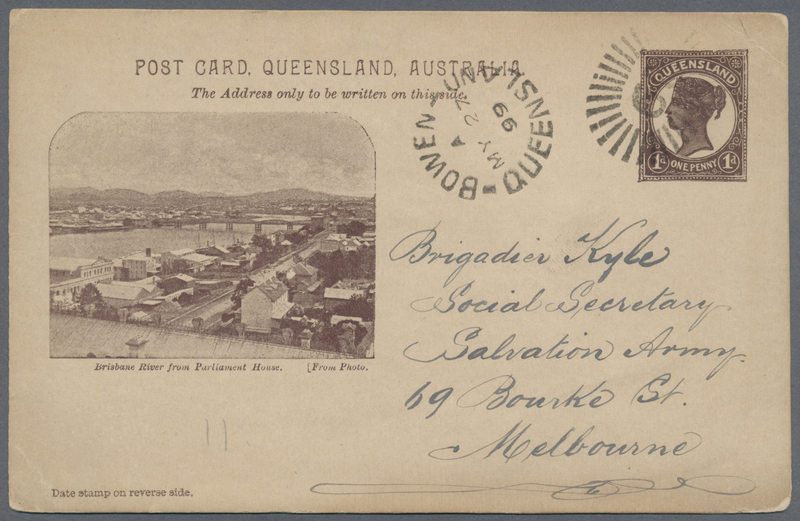 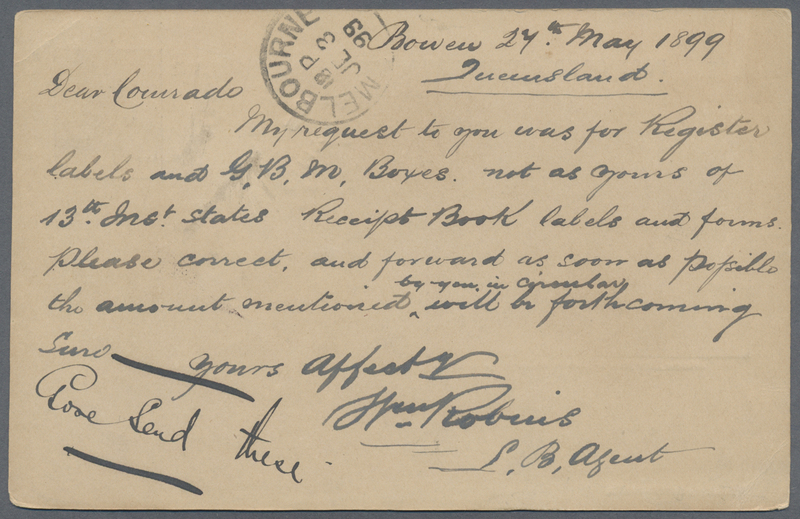 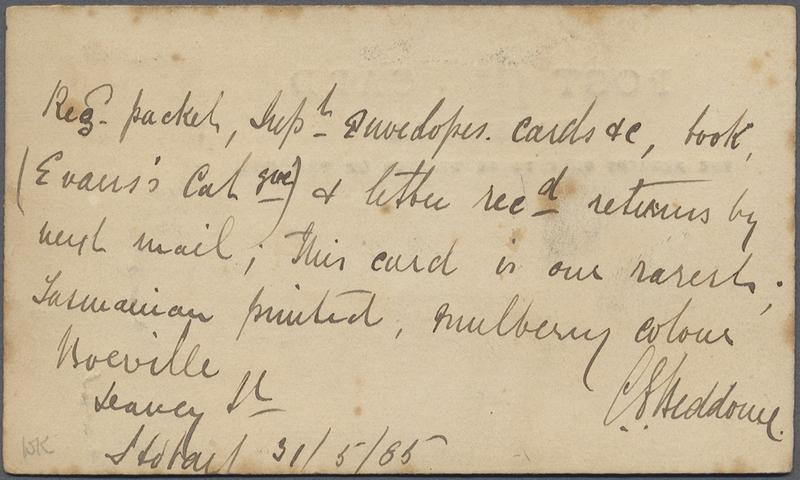 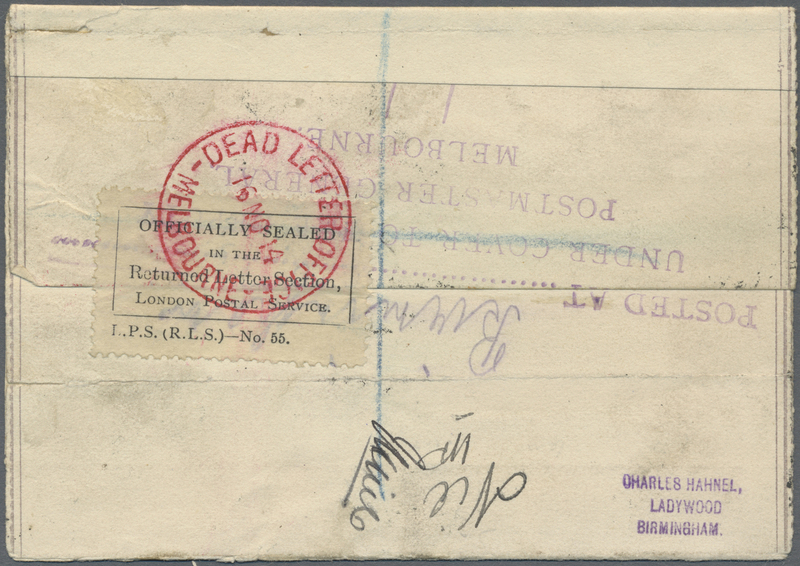 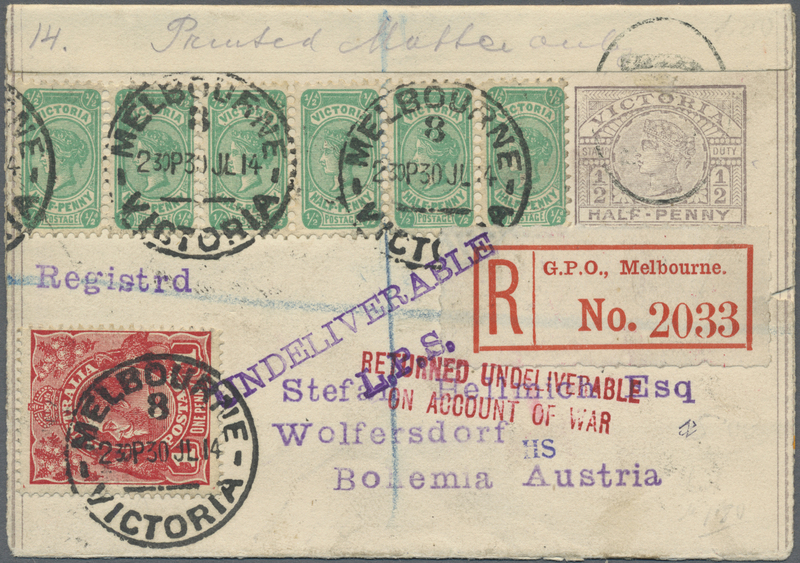 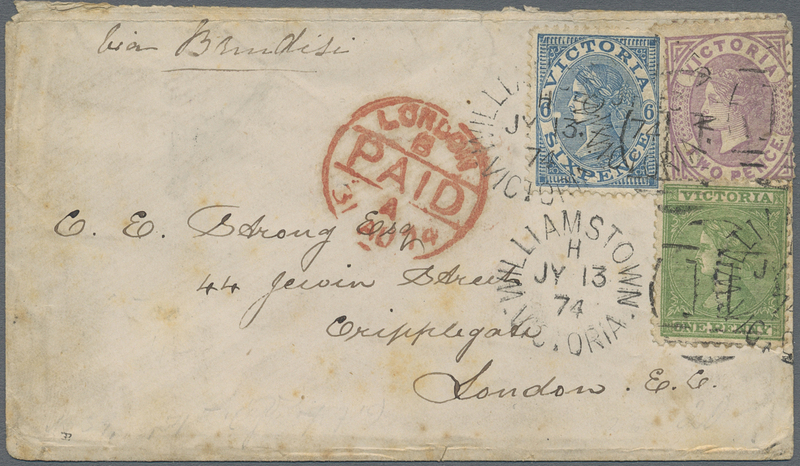 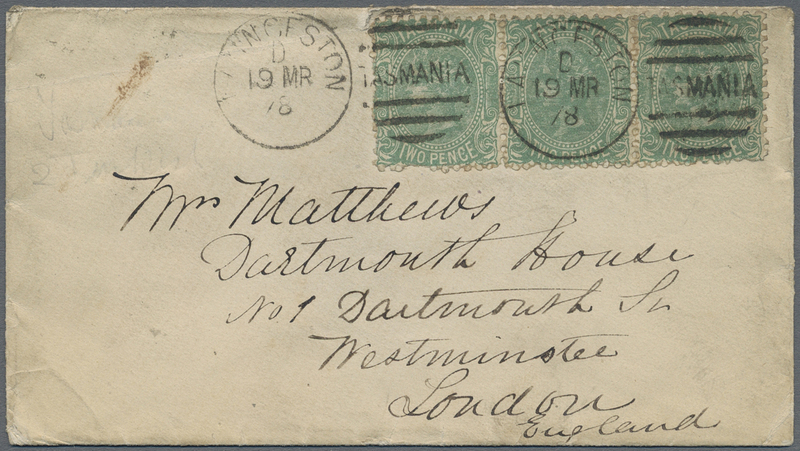 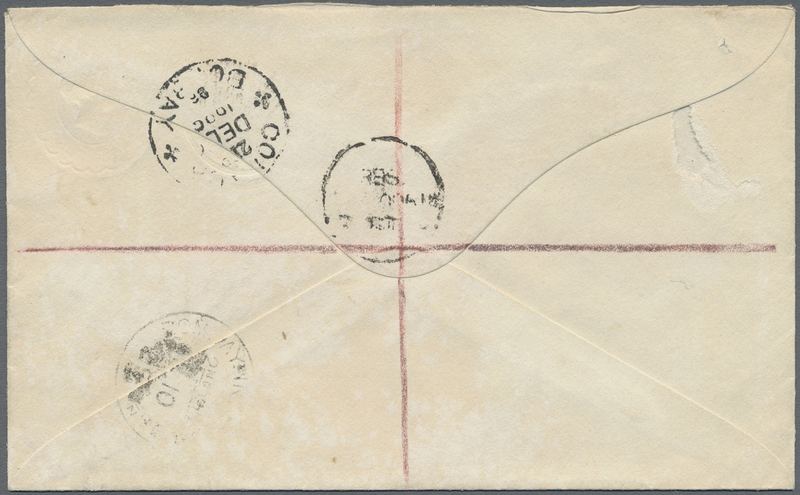 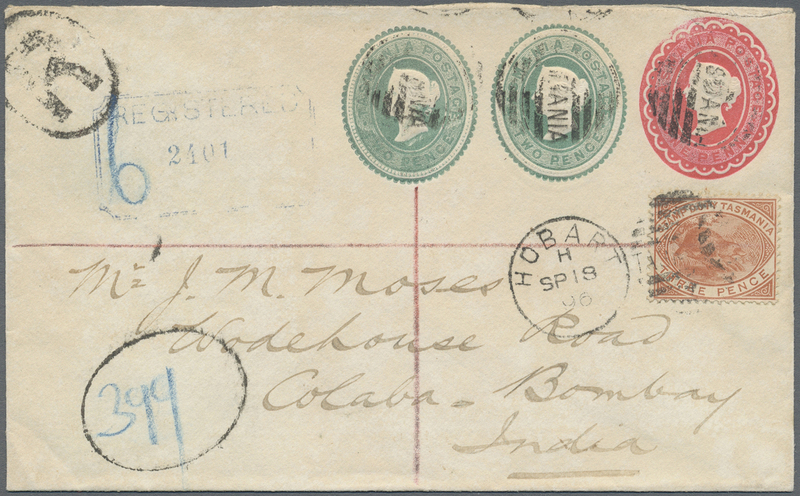 Sent by registered mail from Hobart on September 18, 1896 TO COLABA-BOMBAY, INDIA, with arrival marks. 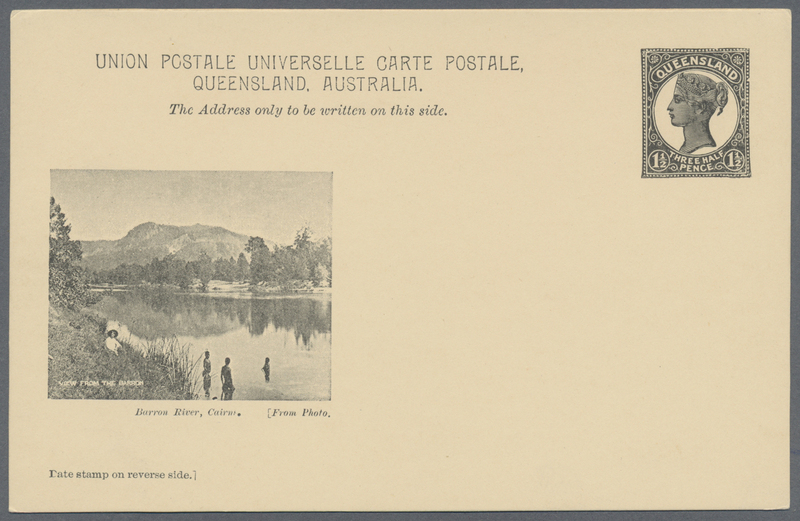 A remarkable and possibly unique destination for this combination with a Platypus. 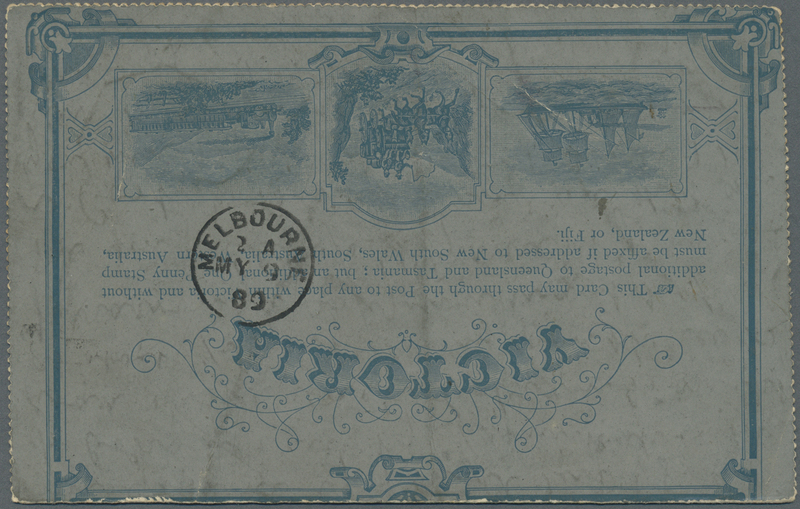 The 5d in embossed stationery stamps paid the international rate and the 3d Platypus revenue Stamp paid the registration fee. 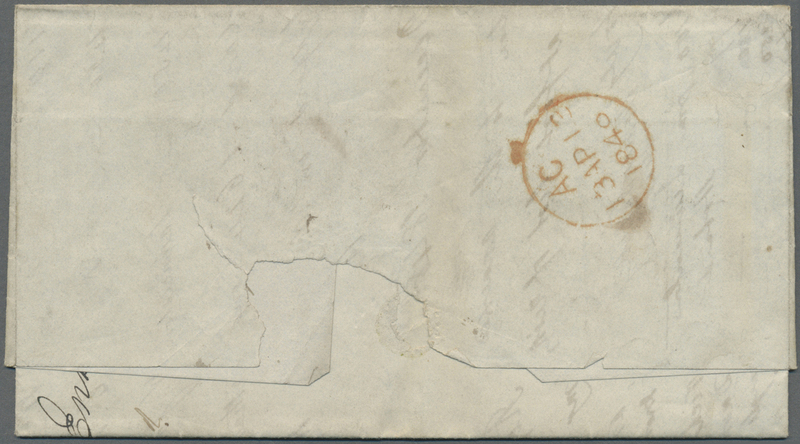 11354 Ganzsache (Complete) E 2c 1898, pictorial stat. 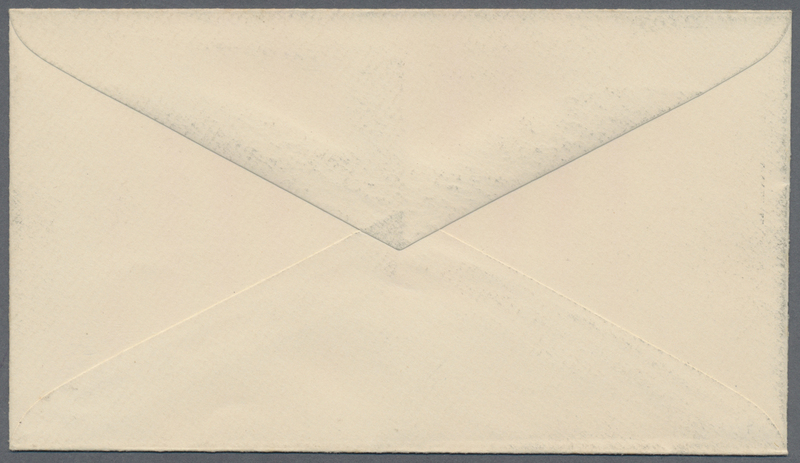 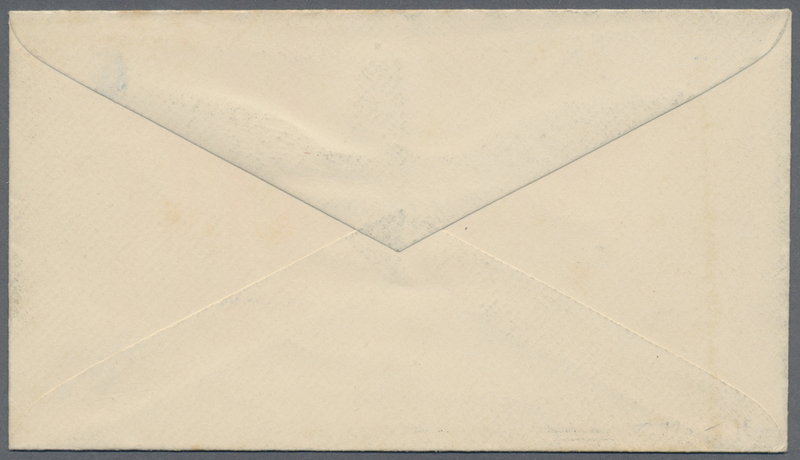 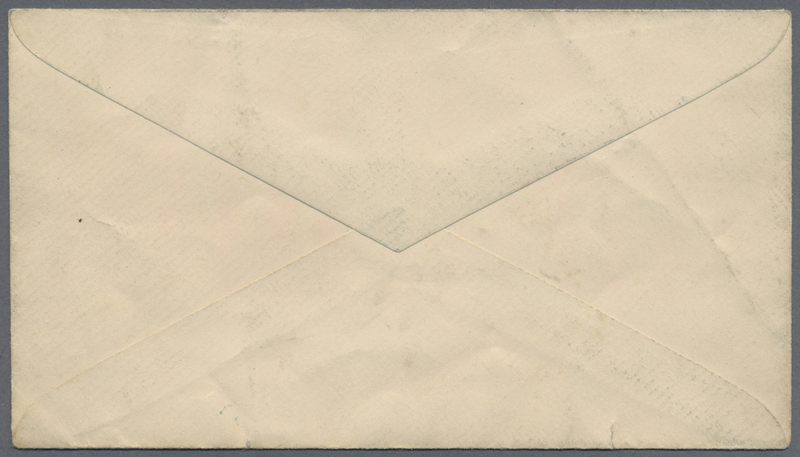 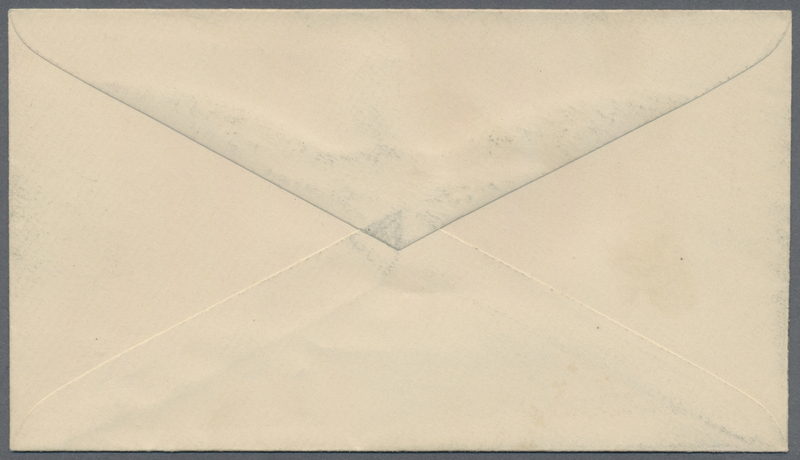 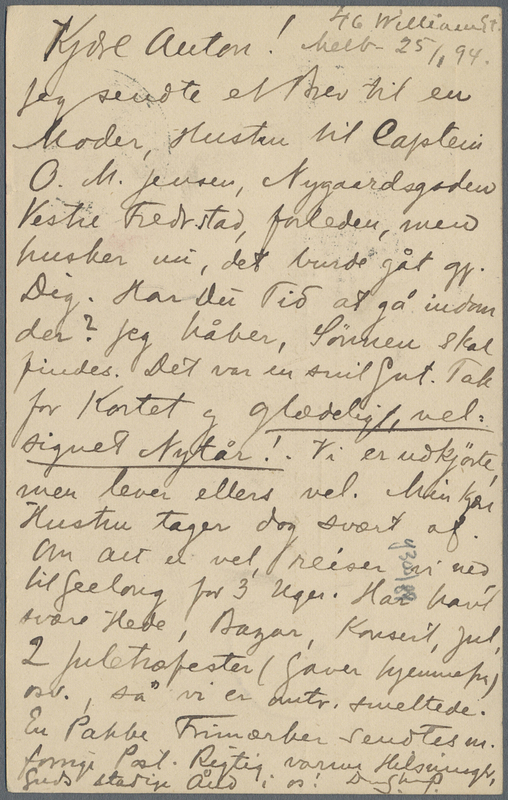 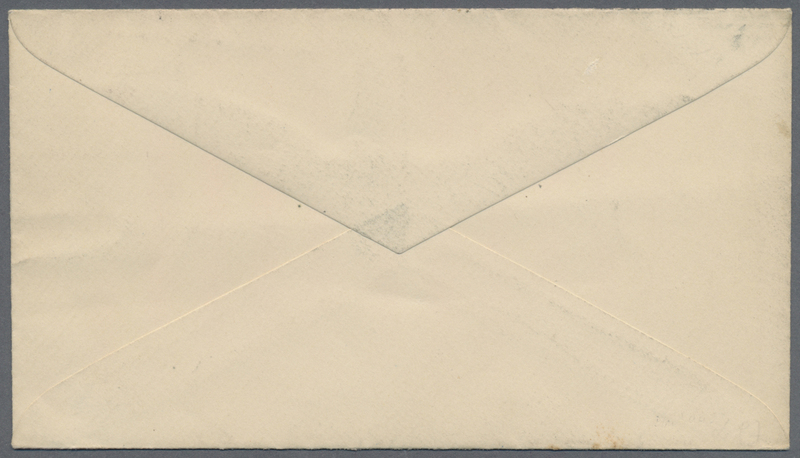 envelope QV 2d. 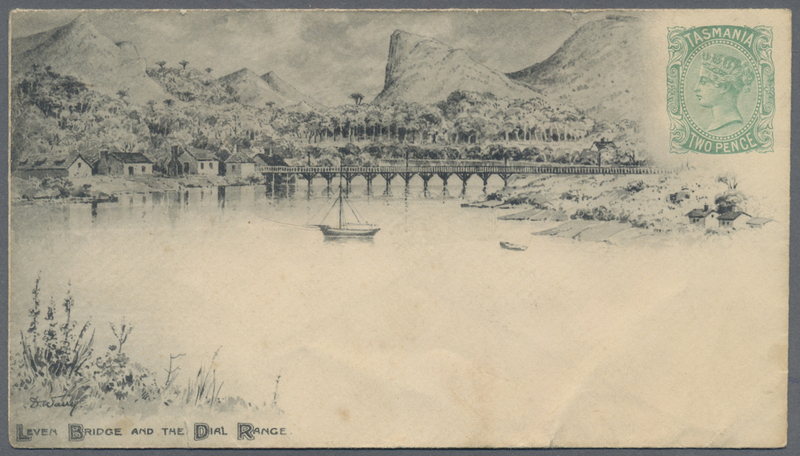 green with picture on front 'LEVEN BRIDGE AND THE DIAL RANGE', unused with some toning/blemishes nevertheless attractive and scarce with only 309 envelopes printed! 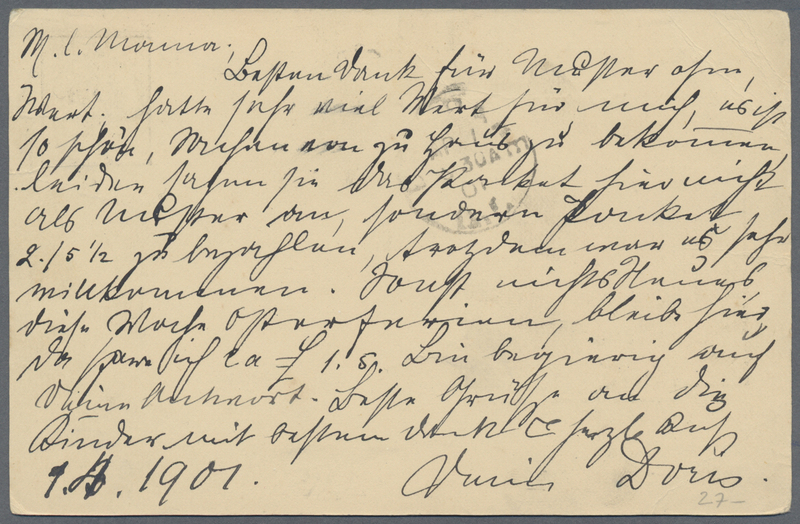 11360 Ganzsache (Complete) E 3f 1898, pictorial stat. 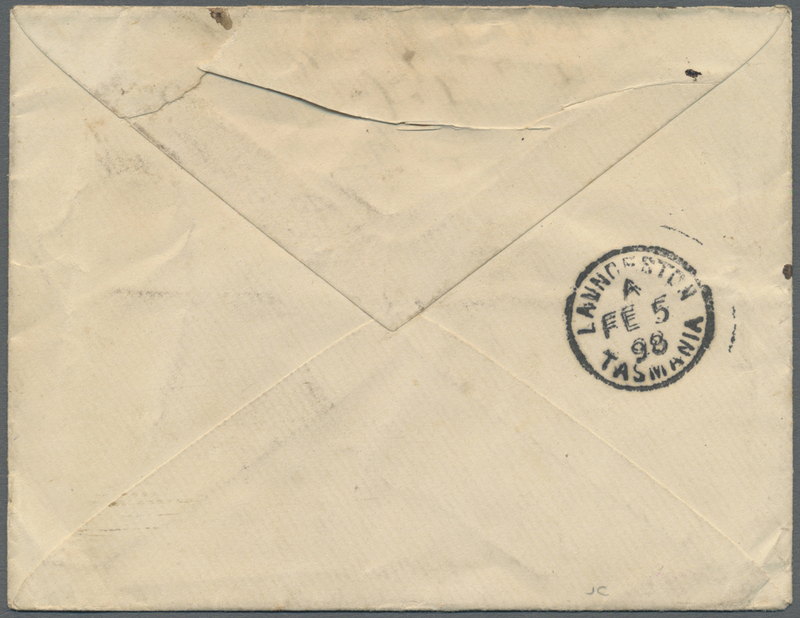 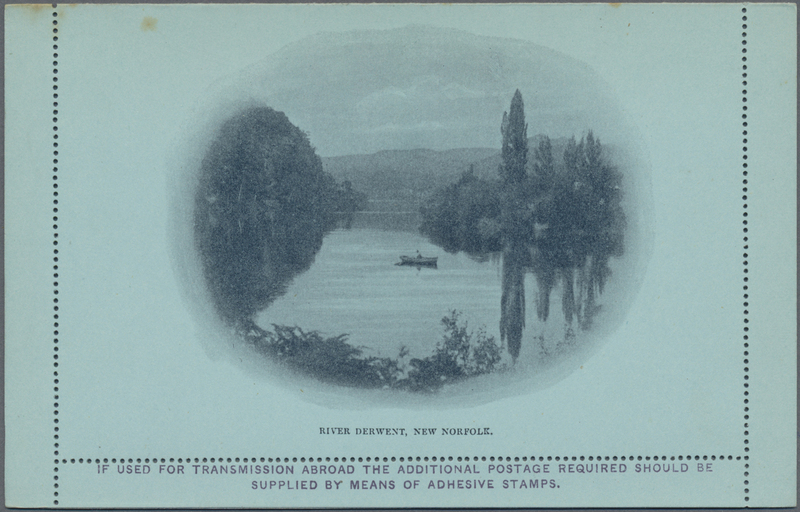 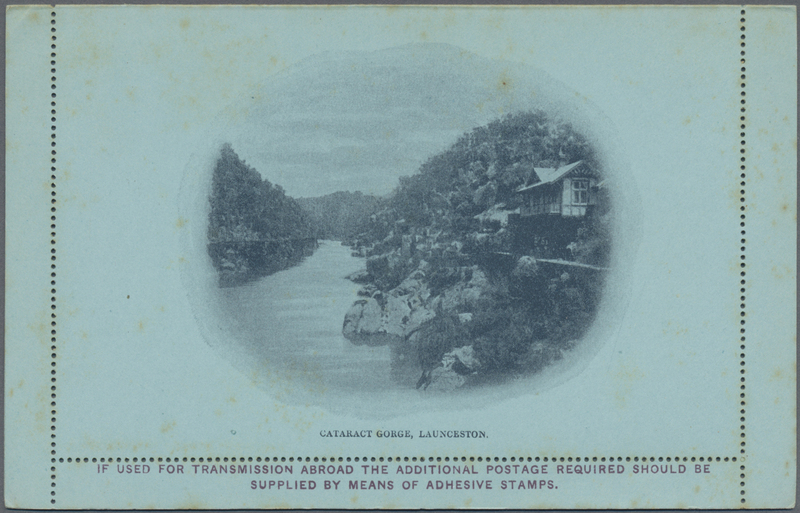 envelope QV 2½ red-purple with picture on front 'THE SOUTH ESK RIVER AT LAUNCESTON', fine unused and very attractive and scarce with only 312 envelopes printed! 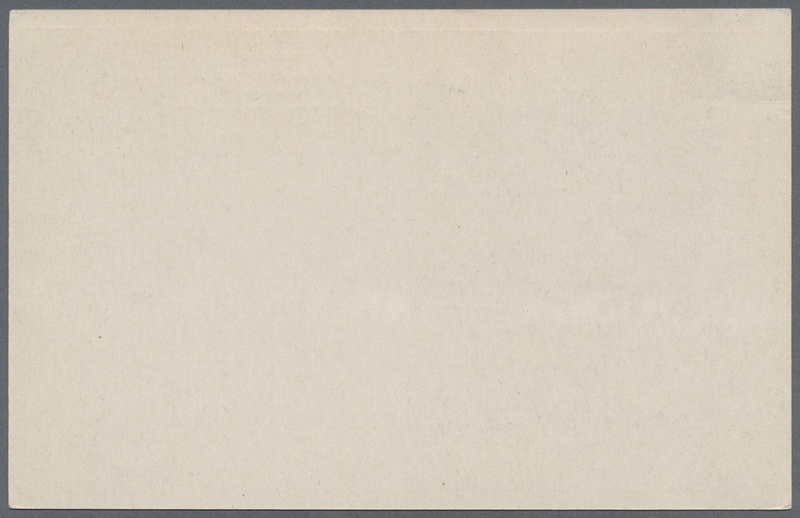 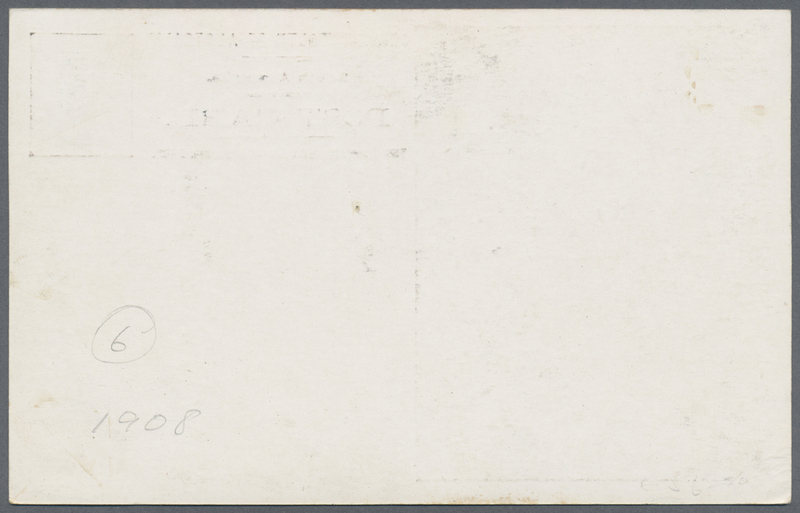 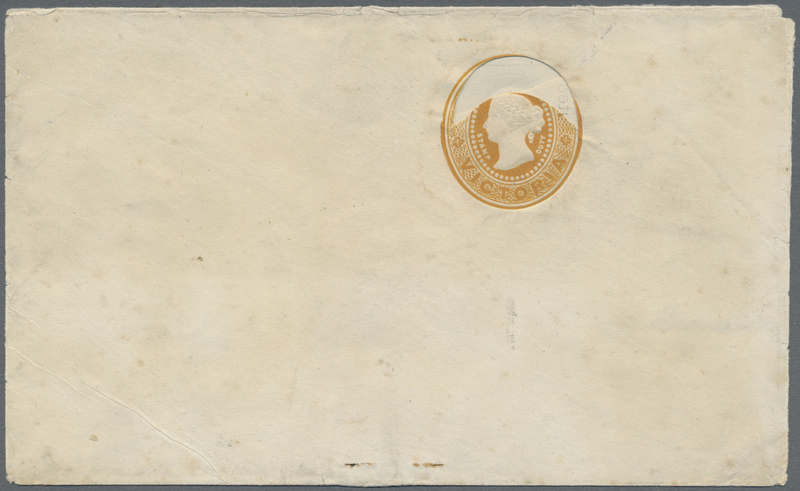 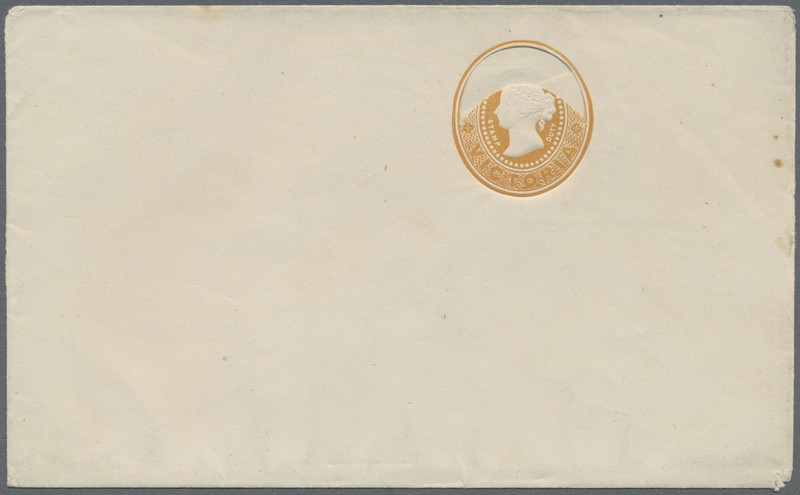 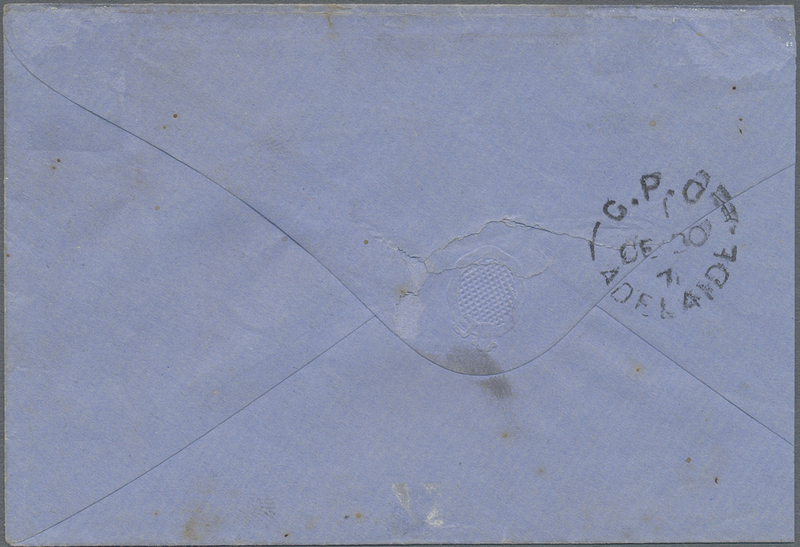 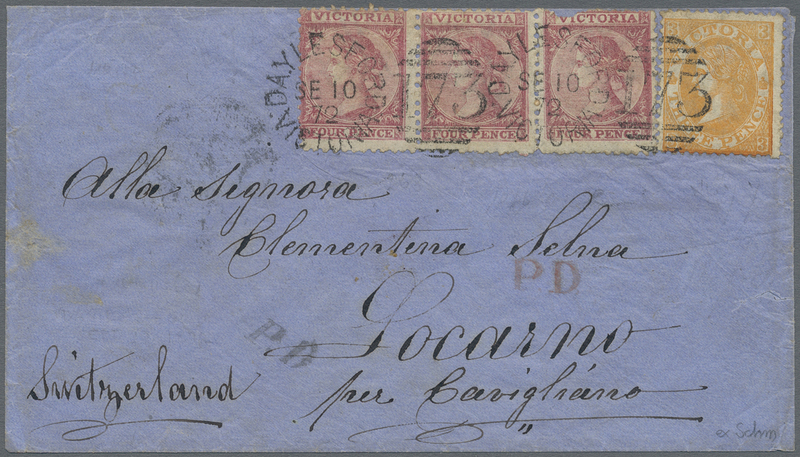 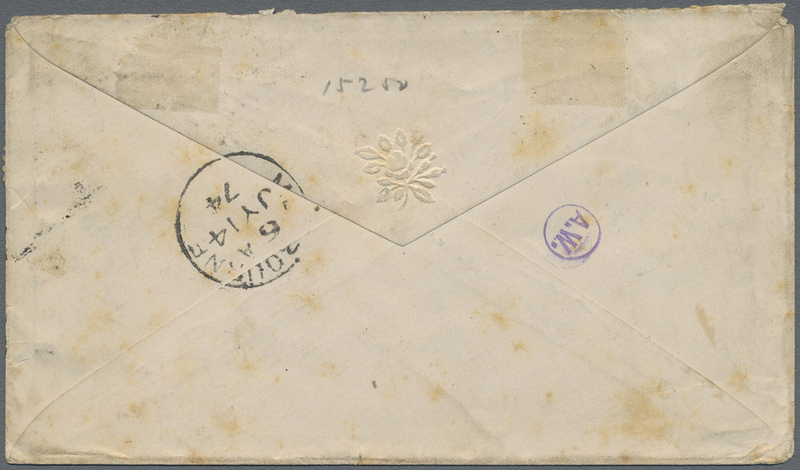 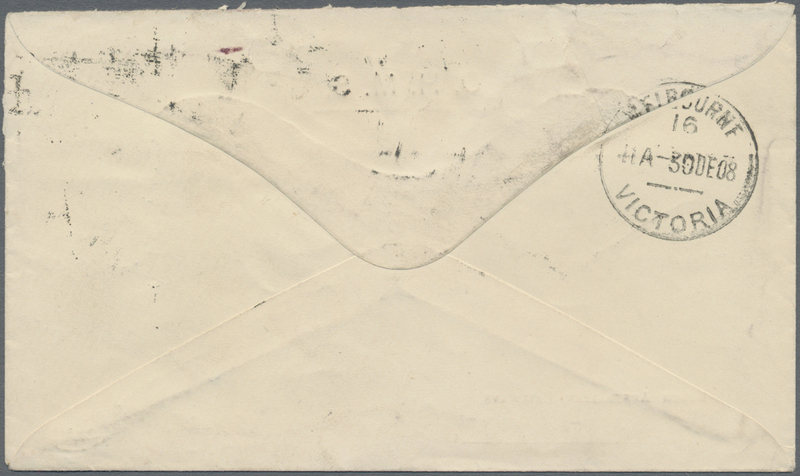 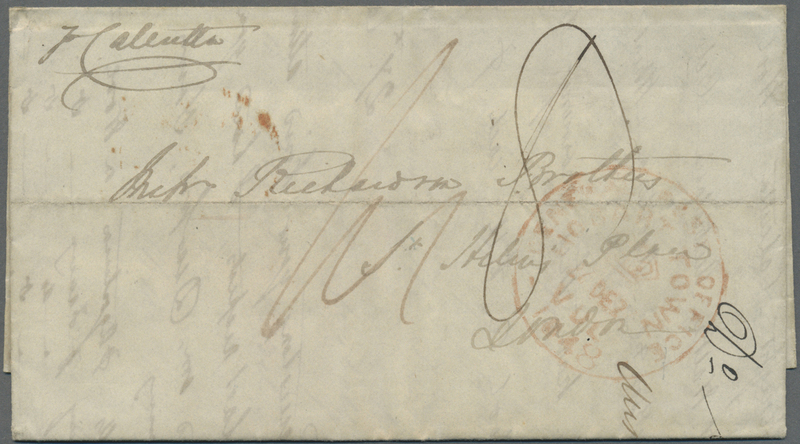 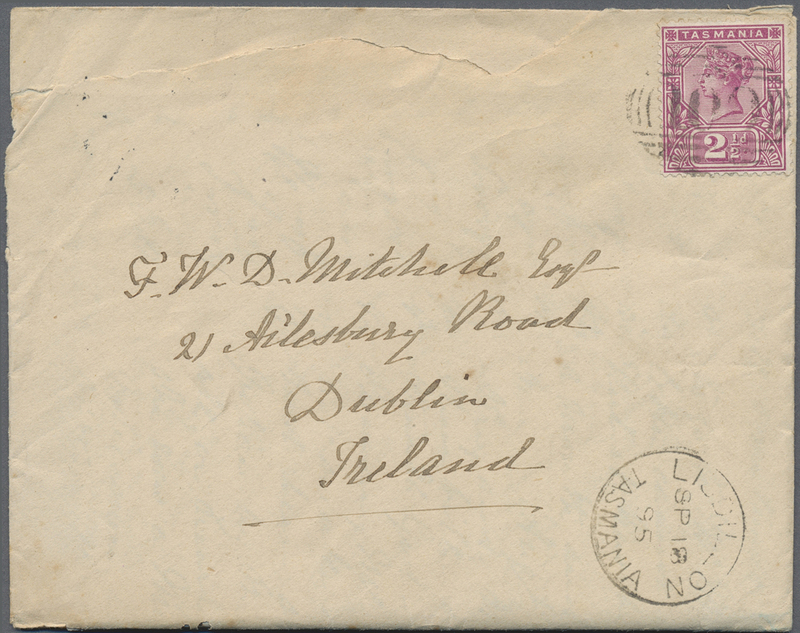 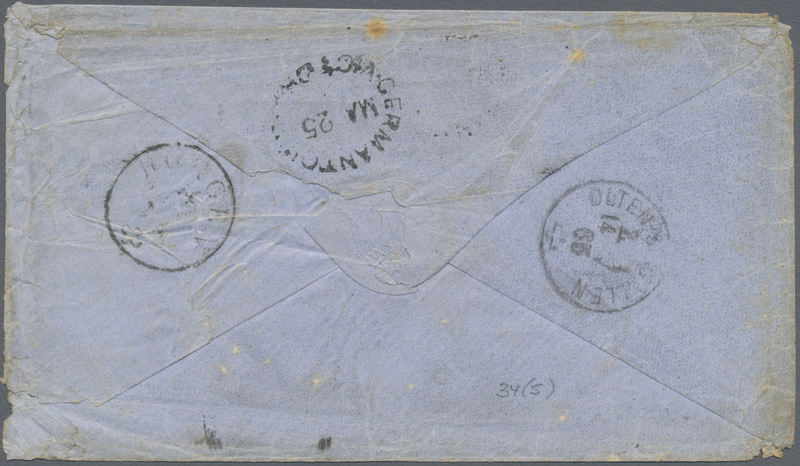 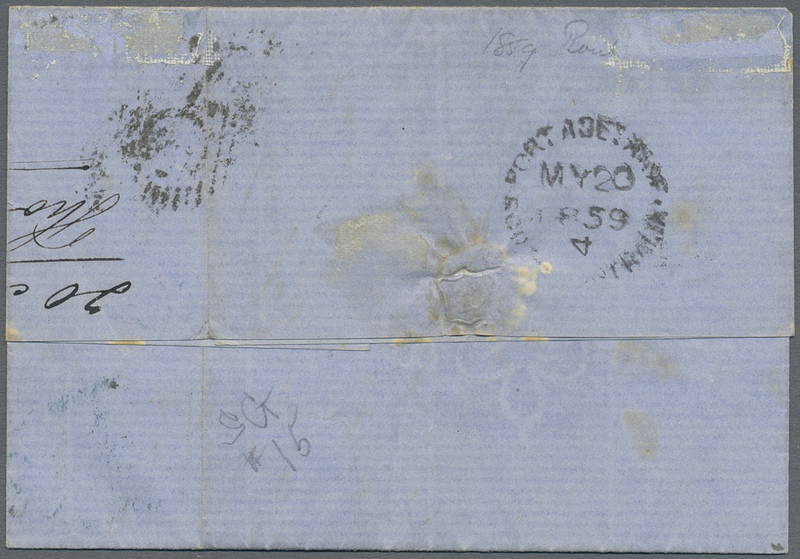 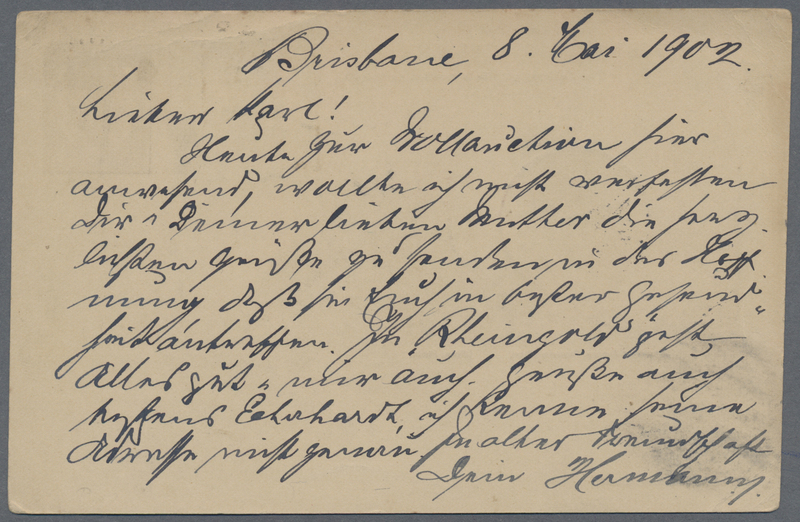 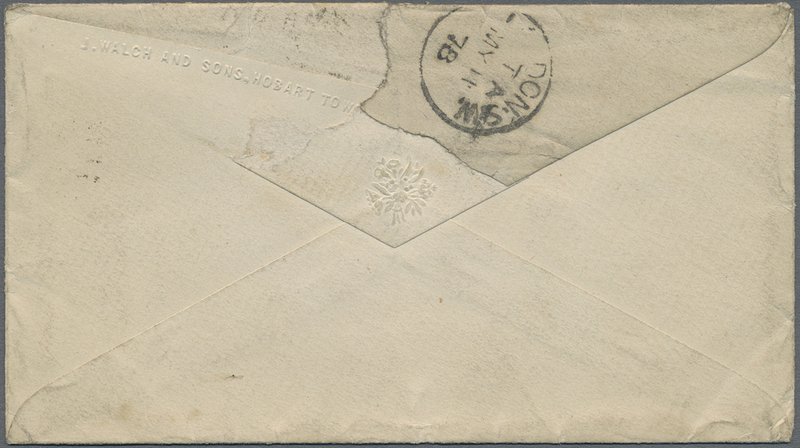 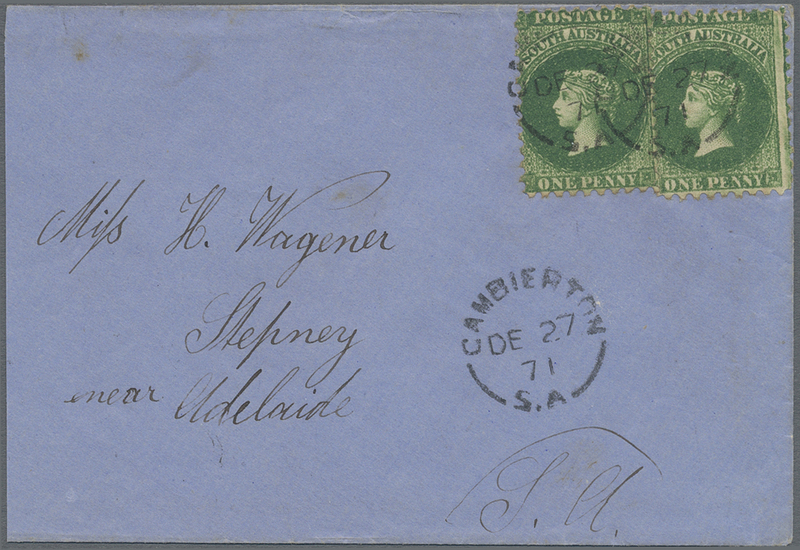 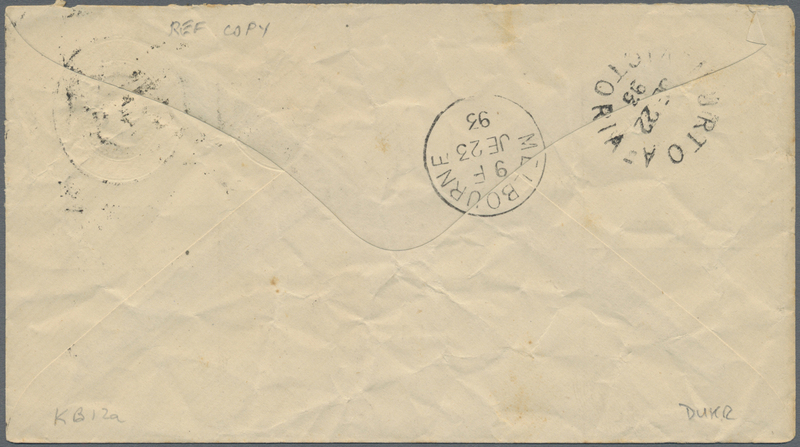 11363 Brief (cover) SG 34 (5) 1865, QV 6 d. black (5) tied oval bar "27" to small envelope with emboss "via Marseilles" from "GERMANTOWN VICTORIA MA 25" to Horgen near Zurich, Switzerland. 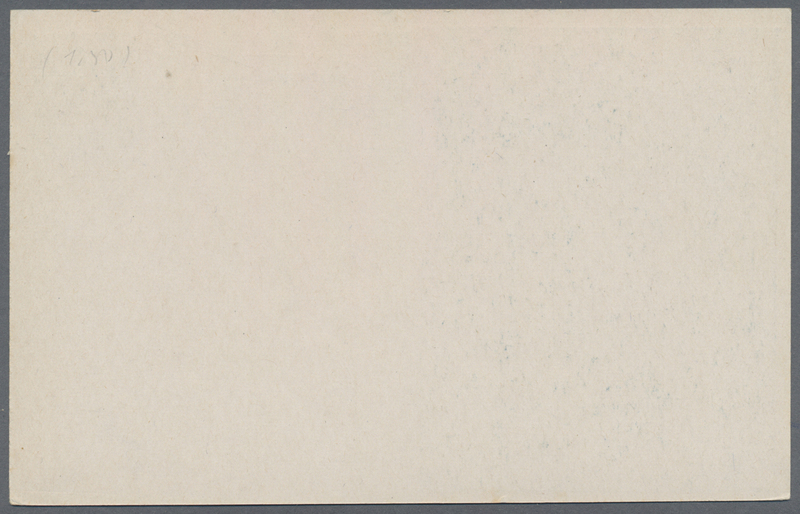 With red "P.D. 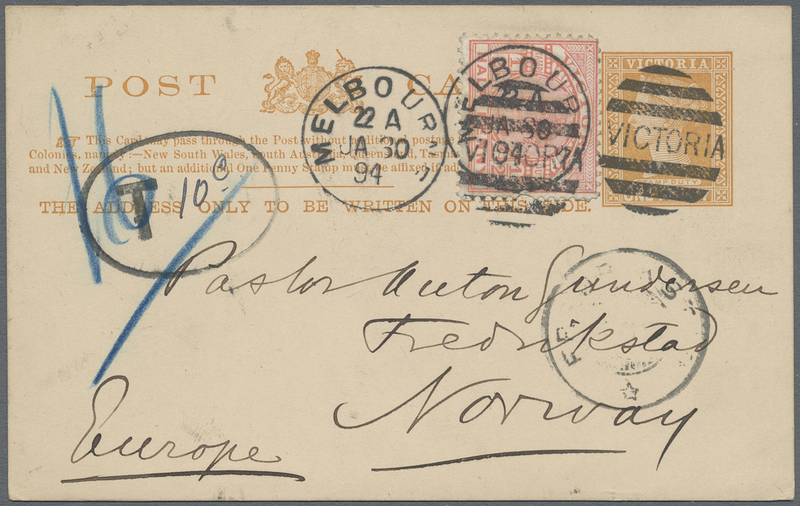 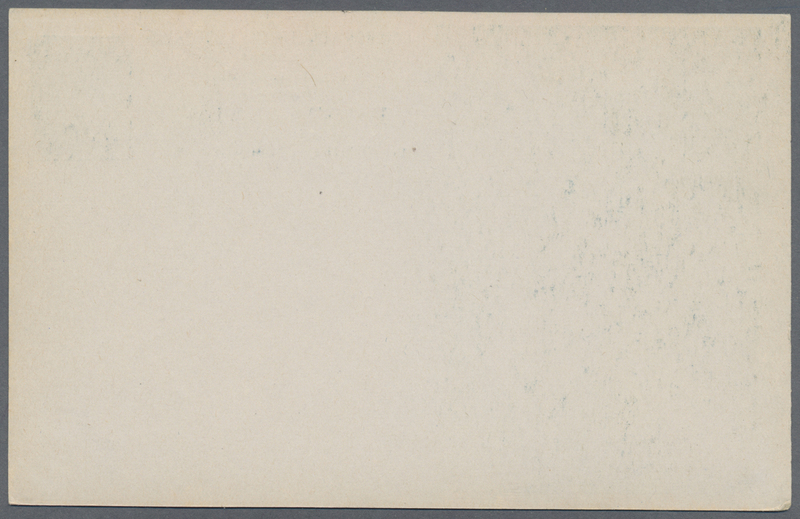 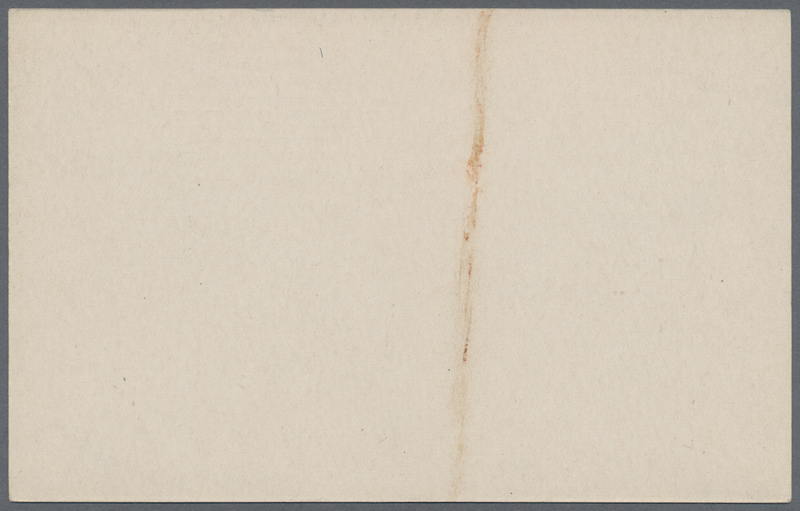 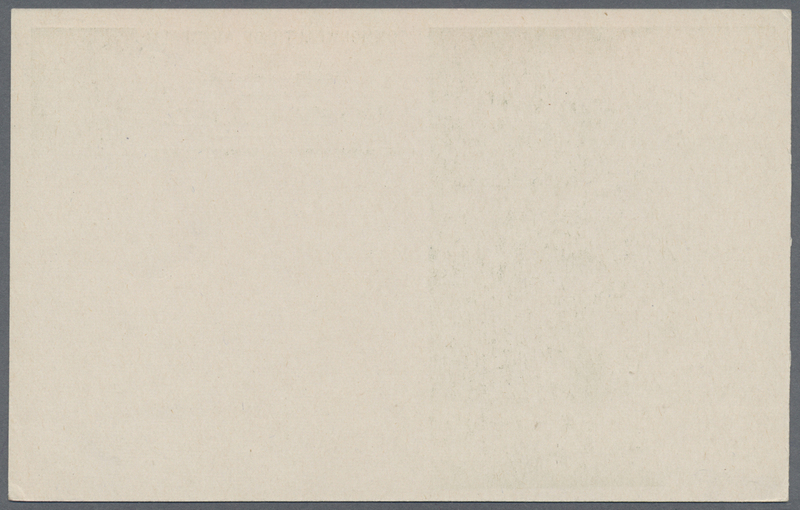 ", on reverse swiss TPO "OLTEN-St. GALLEN 14 V 65" and arrival. 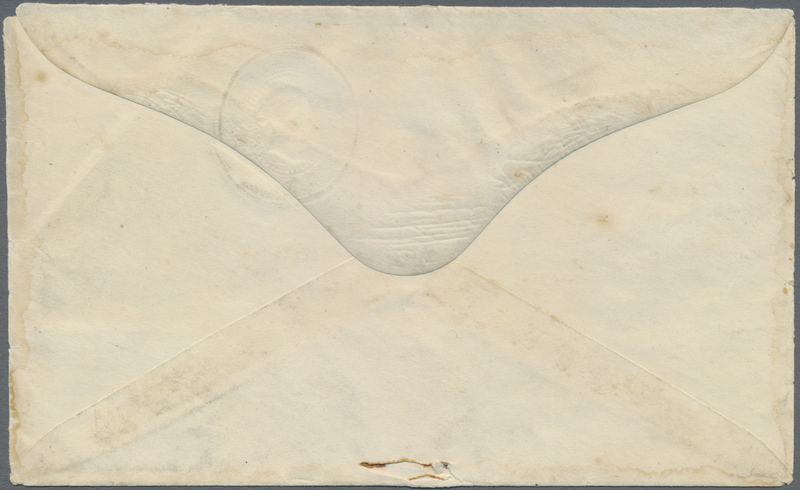 Cover edges some faults.